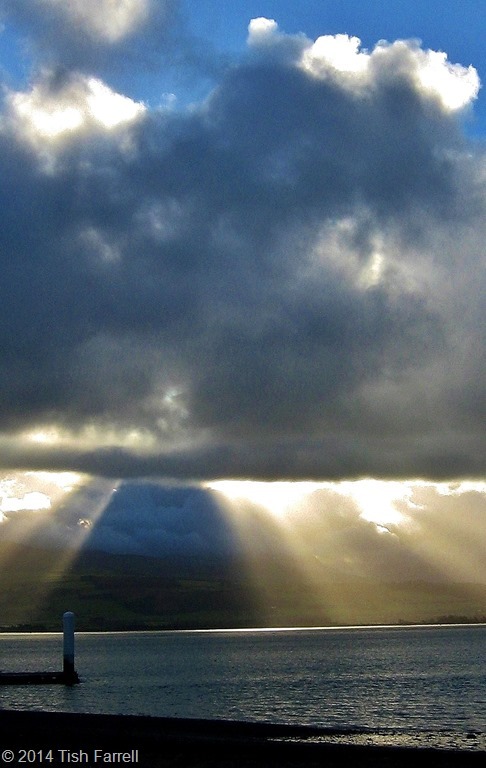 The light, the clouds, the sun do extraordinary things over the Menai Straits, the narrow sea channel between the island of Anglesey, Ynys Môn, and mainland Wales. This photograph was taken at midday in late December. I was standing on Beaumaris seafront and looking towards the mainland. 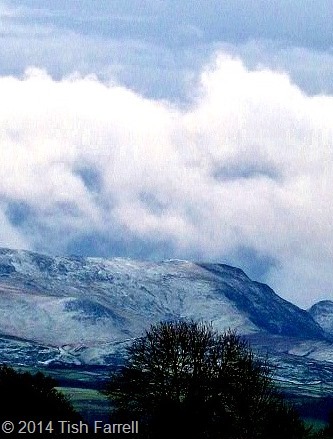 To the southwest the mountains of Snowdonia were frosted with a light cover of snow. It was all very dreamlike. And it made me think that it was no accident that the Druid priests of the ancient Celtic tribes made the island their sacred stronghold, or that after the Romans withdrew from Britain, the early Celtic Christian missionaries established their sanctuaries and churches on the island. Whatever your faith, or even if you have none, such glorious vistas surely speak straight to heart, spirit and soul. For more images of Ynys Môn see my earlier post Island of Old Ghosts. This photo was taken on Boxing Day, on Anglesey – a bright and windy winter’s day in Wales. It has to be asked, this burning, niggling question, but why on earth do we forget women artists so readily? Why is it that their work is less exhibited, less revered or, if noticed at all, only grudgingly accorded a modicum of the status enjoyed by male artists? I leave it to you to supply the answers to these questions. I only note that this same enquiry was the driving force behind Professor Amanda Vickery’s recent BBC2 series The Story of Women and Art. In this too brief historical exploration of forgotten/hidden/suppressed and otherwise invisible women artists, Professor Vickery introduced us to the breath-taking creativity of (among others) Sofonisba Anguissola, Berthe Morisot, Johanna Koerten, Properzia de Rossi and Artemisia Gentileschi. I will be forever grateful for the introduction. Now, though, I have a very particular question. 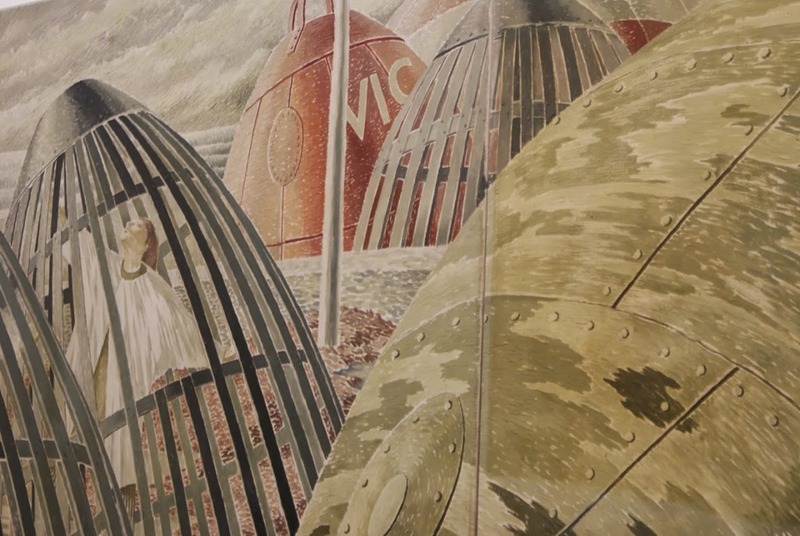 It relates to the work you are about to see – details from a great mural that, until fairly recently, was hidden from view. So my question is this. 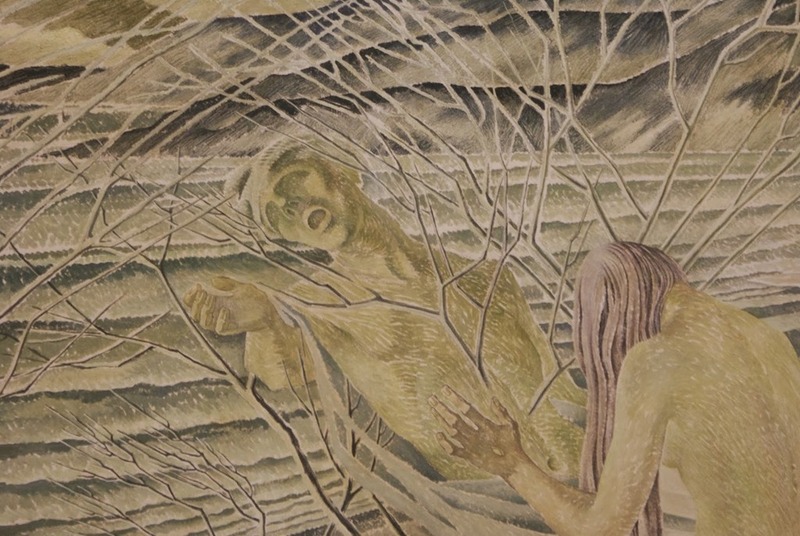 What was in the minds of the people when they took down and concealed from sight this work of lucent genius by Mildred Elsi Eldridge; how did they feel when they stowed away the Dance of Life? Sorely deflated? Bereft? As if the light had gone out? 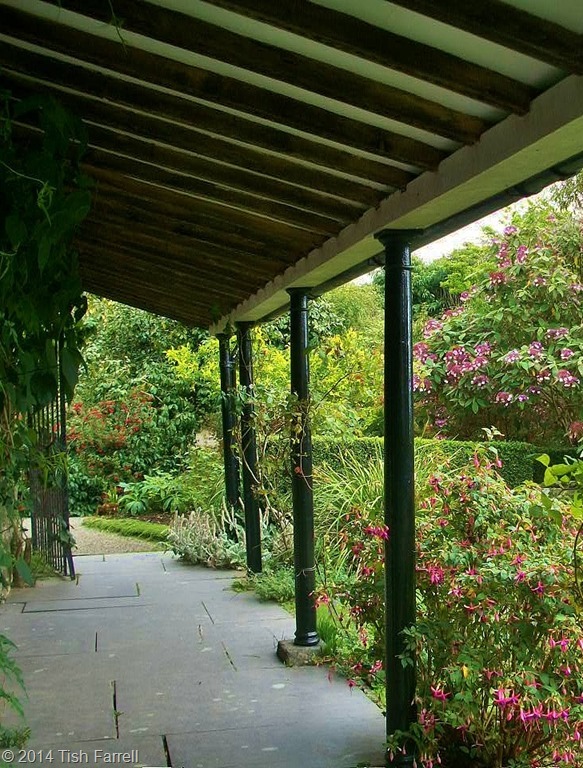 The work was originally commissioned in the early 1950s by the Hospital Management Committee of the Robert Jones Agnes Hunt Orthopaedic Hospital, Gobowen near Oswestry in Shropshire. 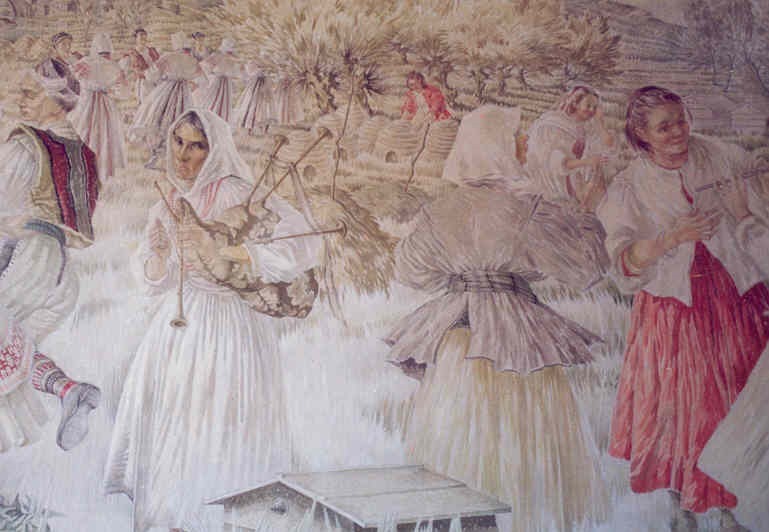 A new nurse’s home had been built and the mural was to hang in the dining hall. 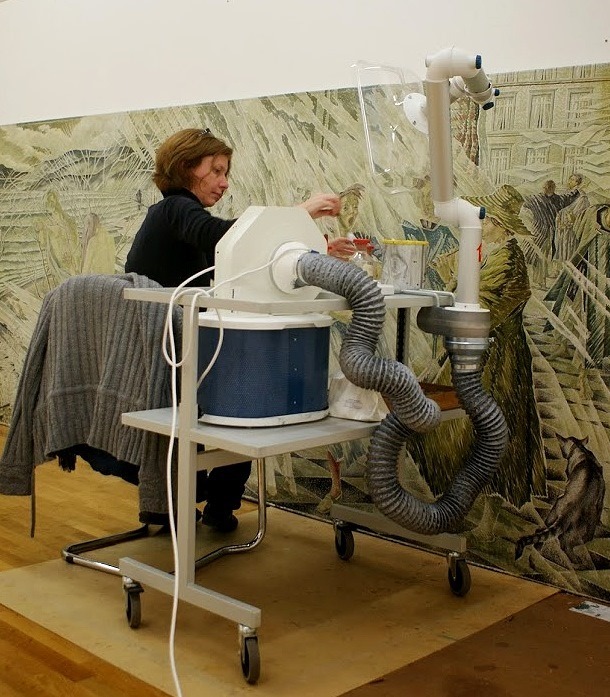 The hospital’s Doctors Menzies and Salt had recently been to Sweden and seen how art was being introduced to hospitals to enhance the healing process. 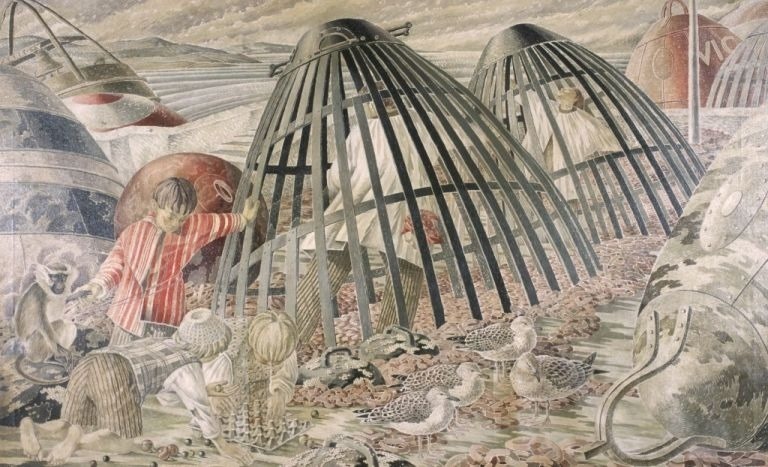 The fee for the commission was £500 and the work took M E Eldridge around five years to complete (Gwydion Thomas in Life and Times of M E Eldridge). 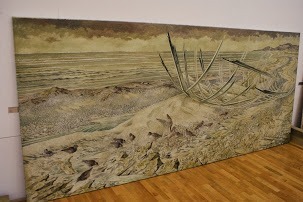 In 1999, after being on display for forty years, the mural was put into storage. The hospital was undergoing development. But once consigned to custodial care, it was over a decade before moves were made to restore the panels and find them a new home. Elsi’s son, Gwydion Thomas, was a child when the panels were being painted (see the boy with the monkey above). 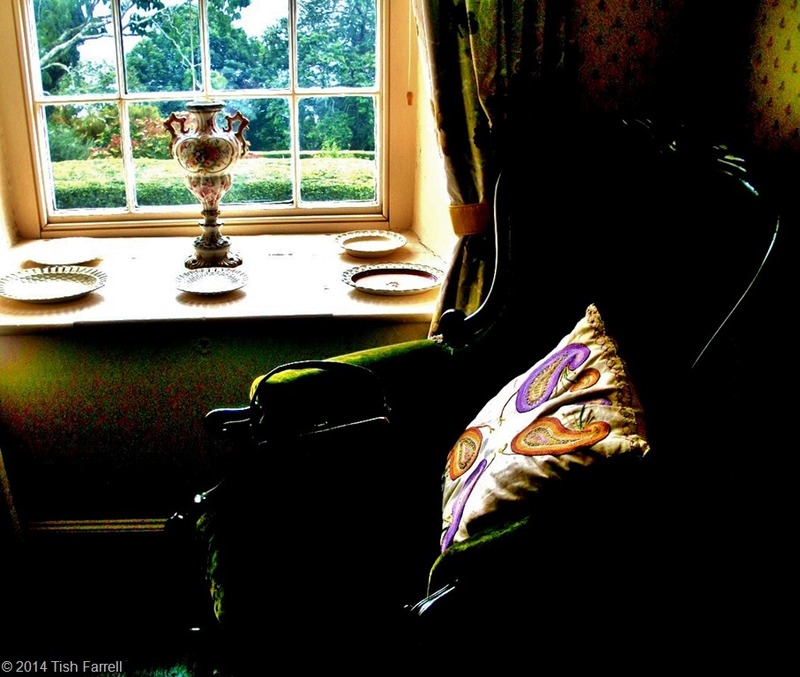 He says the work was created in their home, in the drawing room of Manafon Rectory, Montgomery. He says that, as there was not enough wall space to hang the work in progress, Elsi rolled up completed portions as she went along, hanging others over doors as she was painting. He says the work wound many times around the room. It is a sharp glimpse into this woman’s focus, vision and determination. 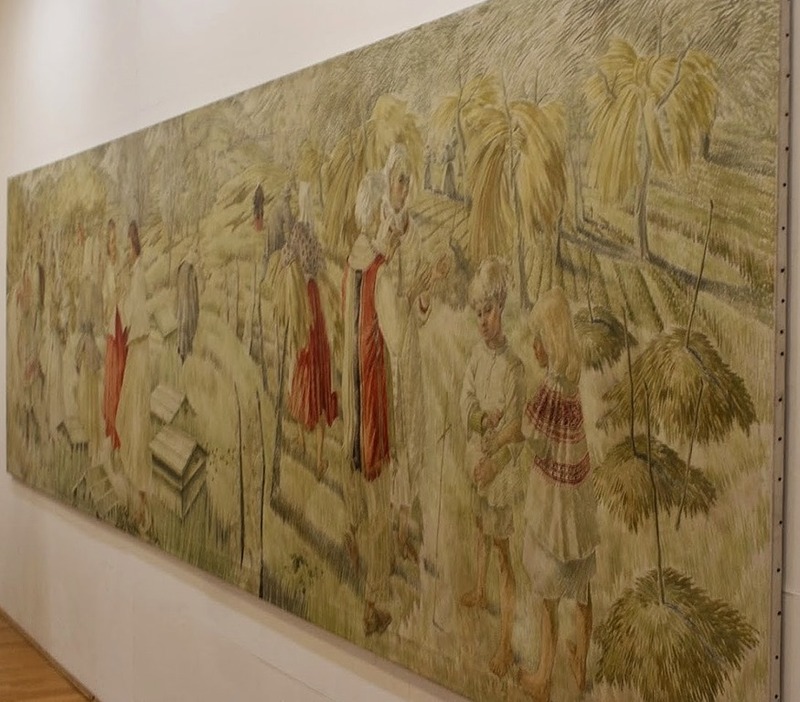 Art Historian, Peter Lord, has described the work as “a masterpiece on so many levels”, while pointing out not only the technical ambitiousness of so large a project, but also the fact that Elsi completed the work without a suitable studio. 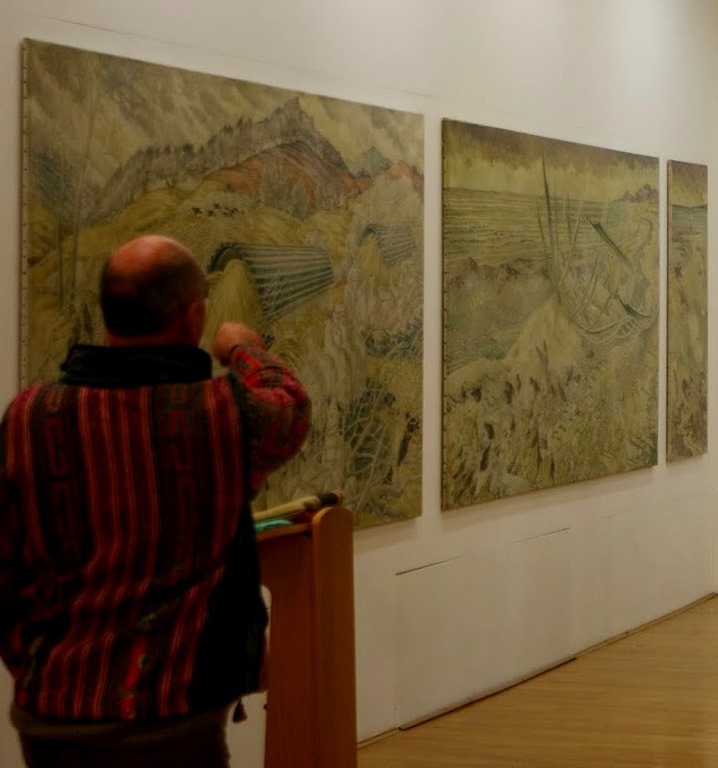 It is good news, then, that Dance of Life has now been released from custody, restored and put on permanent view at Glyndŵr University’s Centre for the Creative Industries in Wrexham. It can be viewed by visiting the main University Reception (tel: 01978 293950). 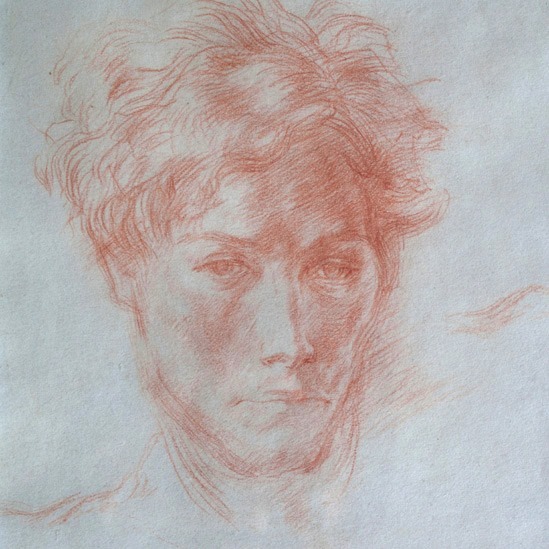 So: you have seen some of her work, including that self-assured self-portrait at the start of this post, but what of the artist M E Eldridge? Why isn’t she better known? A free studentship in 1931 took me to the RCA which in those days was attached to the Victoria and Albert Museum. There were huge doors from the V&A into the College which were kept securely locked but as there was always one of the museum keepers on duty on the other side of the doors, special signs and knocks could be made so that after signing on at the RCA entrance desk it was possible to escape into the V&A and make drawings of the splendid treasures in the museum, or experimental drawings of one’s own which would probably have received severe criticism from the RCA staff. From there, sallies could be made to the Science Museum across Exhibition Road or to the Natural History Museum to make studies of animals, plants and fungus. In 1934 The Rome Scholarship competition was held – the subject Music. I submitted the 5′ x 5′ Telling the Bees which later became the central part of the first panel in the mural in the Dining Hall of theNurses’ Home at the Gobowen Orthopaedic Hospital. She turned her back on the glitter, and headed off in her Bentley for the Shropshire-Wales borderlands to teach at Oswestry High School and Moreton Hall School for Girls in Shropshire. 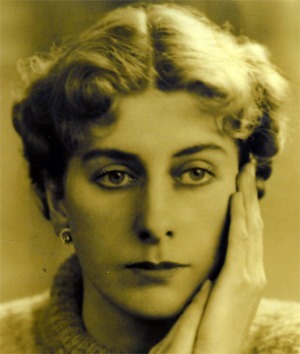 She lodged just over the border in Wales, in Chirk near Wrexham, and it was in the house where she was staying that she met the fellow lodger, a young curate, who was to become known to the world as poet, R.S. Thomas. 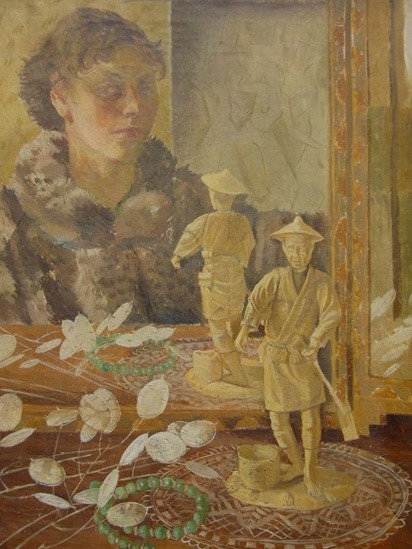 She made this portrait of him in 1940, the year of their marriage. It would be easy to say that the growing fame of RS eclipsed or stunted Elsi’s talent. He apparently took no interest in her work or did anything to encourage her. 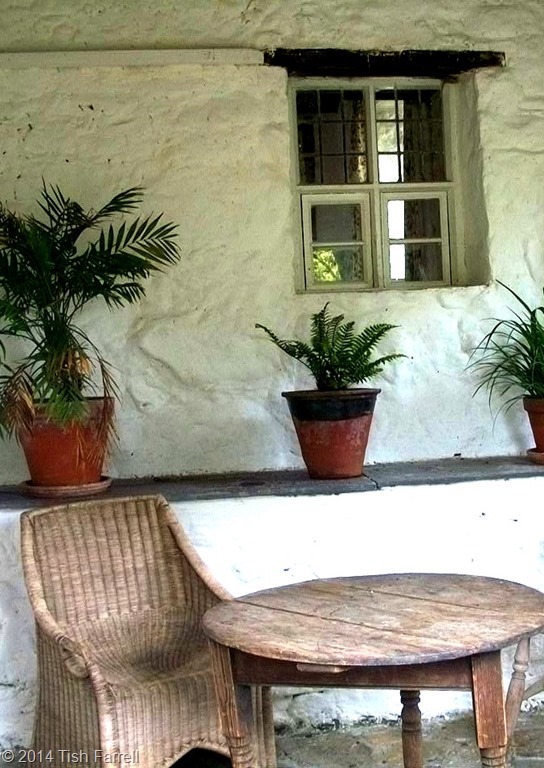 There is a revealing interview in the New Welsh Review issue 64 in which Gwydion Thomas says that after Elsi’s death in 1991, his father wondered if Elsi would have “gone on painting properly” if, as they moved from rectory to rectory across Wales, he had ever bothered to arrange for a house with suitable work space for her. 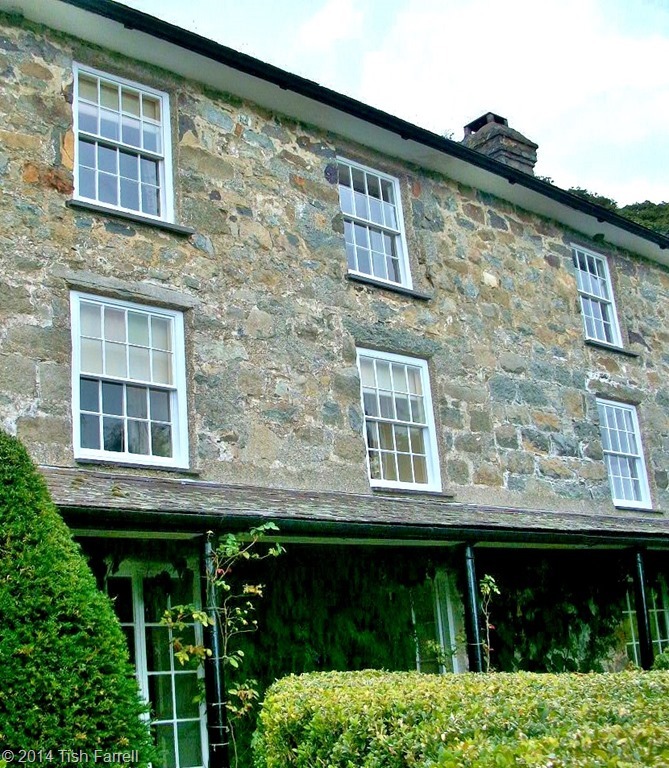 RS admitted, too, that he should never have expected her to live at Sarn y Plas in Rhiw (see the previous post) after he retired from the priesthood, and the church authorities would not allow them to buy the Aberdaron rectory with its pleasant rooms and fine views. 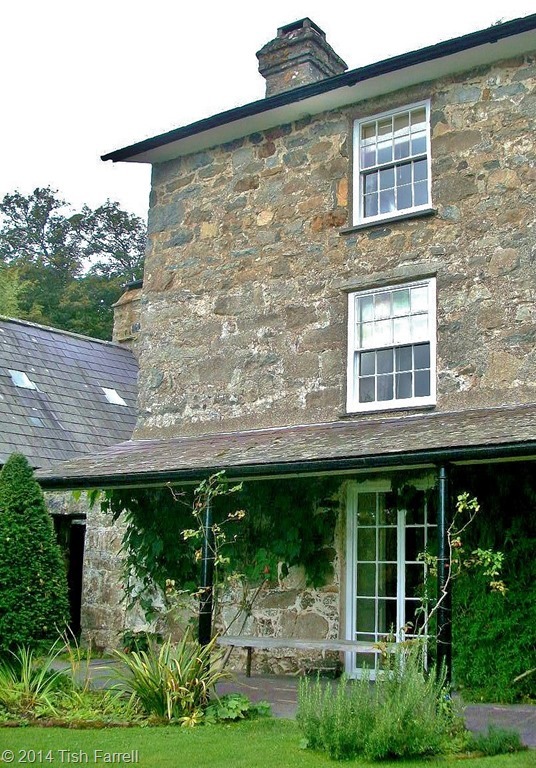 Gwydion describes her room at the house in Rhiw: so dark with two tiny windows, and damp too. She had to keep her paintings in black plastic refuse bags to protect them from the water that dripped through the walls. It was so cold, that as she painted, she kept her feet inside a cardboard box, along with a two-bar electric heater, and so was frequently burned. The room also had a low loft which she reached by means of a ladder. Here, with the company of mice, she both slept and worked. 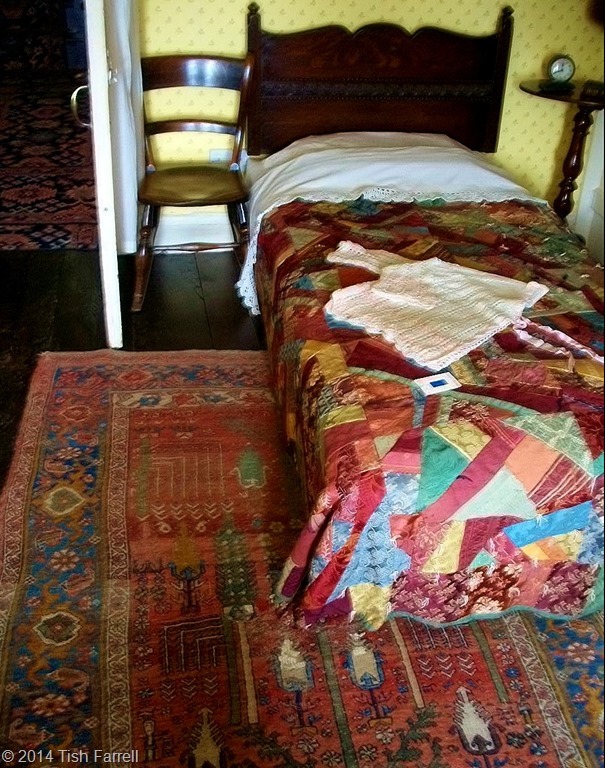 Tellingly, the new room that the Thomases built at Sarn y Plas served RS as bed-sitting room. a remarkable and talented woman. She painted, and sold, some 2,000 finished pictures and produced innumerable studies…She was a weaver, a sculptor, a clothes maker – she made me clothes out of rabbit and mole skins – and a knitter, a teacher, a writer and illustrator of children’s books…She designed altar cloths, stained glass windows and wrought-iron chandeliers. She designed and planted four gardens, raised a child, cooked for my father: four meals a day, every day, for 50 years. He did not know why she stopped painting landscapes, and took to churning out what he calls ‘pretty’ paintings and illustrations. But he does say something that is perhaps illuminating. 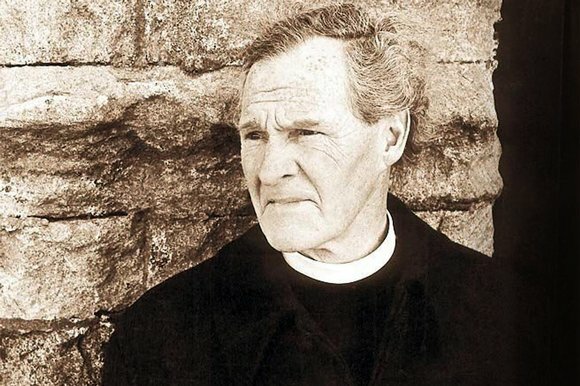 He says that when his parents first met, RS was writing “dreadful imitations of soppy Georgian poetry”, and full of dreams of Celtic romance. 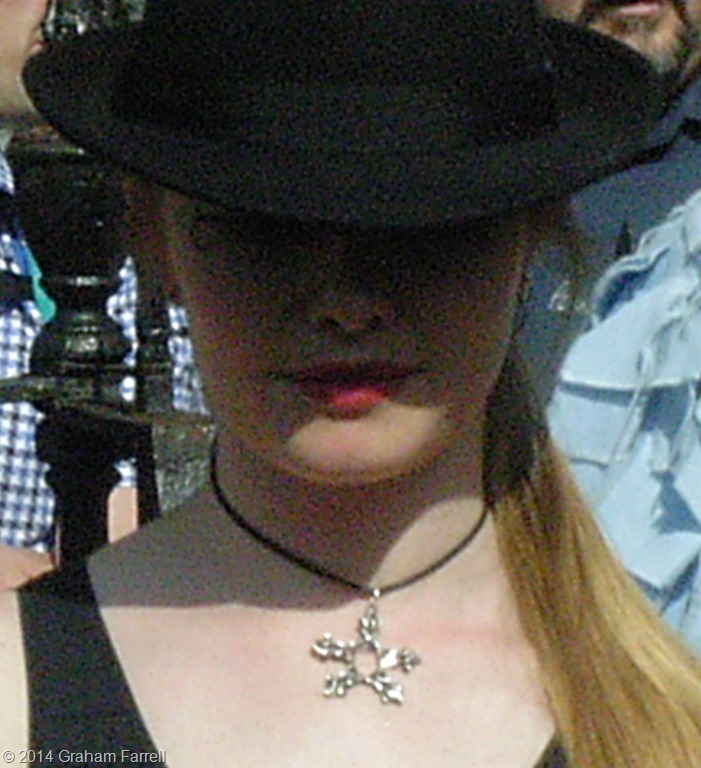 Then along comes this vibrant, shining, well read, well travelled and sophisticated young woman who can introduce him to other kinds of literature, and to the wider world besides. When it comes to Elsi’s influence on the poet, R S Thomas scholar, Jason Walford Davies, calls her a catalyst, a promoter, the one who made things possible, and helped RS realize a career as poet. She certainly inspired him to write some of his most humane and moving poems. And so perhaps, in a sense, R S Thomas was also one of Elsi’s creations, a co-creation certainly. She gave him the gift of possibility, and that is a great gift indeed. Her artist self may indeed have been diminished by the marriage, although she strikes me as a woman who knew her own mind and made her choices accordingly. Perhaps she had painted out all her best thoughts, and felt she had nothing more to add in terms of ‘great works’. She anyway never stopped creating, making paintings for Medici greetings cards for instance, and she was working still when she could barely see. There seems to be no single explanation, then, as to why M E Eldridge, after such a glittering start, is not better known today. Clearly she had some hand in this when she decided to drive away from her London career, and head for the Welsh Marches. But then to leave in a Bentley, that most self-aggrandizing of vehicles? It is all so playfully enigmatic. And so instead of answers, I leave you, in like vein, with this alluring abstract study called ‘Gwydion’s treasures 1952’. 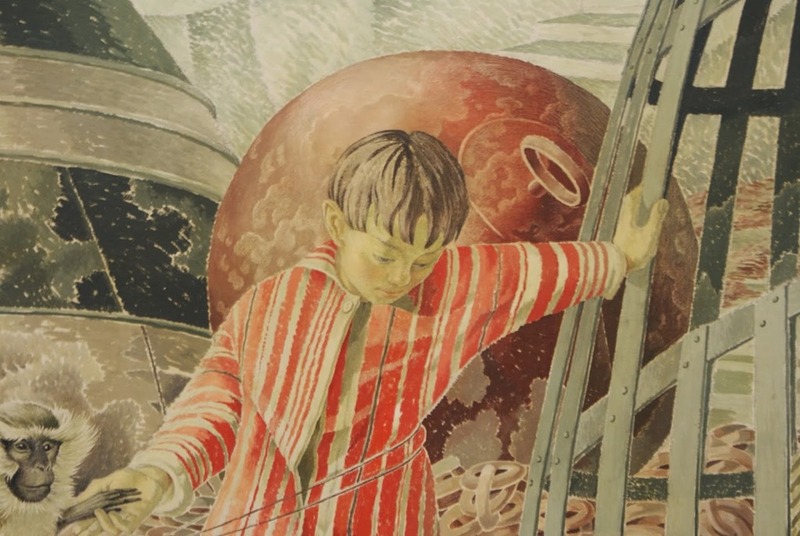 I love the shining light in the marbles: what a heart-felt evocation of childhood freedom, and not a shred of sentiment. Only wonder at the cycle of life and death to be observed upon the sea shore, and seen through the endlessly enquiring eyes of a child. Her child. or in the fabric of this old, old house whose stones reflect the end-of-summer sky and the steely blue-greys of the sea below. Even the air around the house feels strangely soft. It is the kind of late September softness that makes you want to lie down in the grass and dream for days and years, listening only to insect hum and the chatter of sparrows. The setting anyway is blissful; all enclosed by woodland at the foot of Mynyth Rhiw Mountain, and embraced by the seeming sheltering curve of Hell’s Mouth Bay (Porth Neigwl). So now you have it, an inkling that the tranquil surface overlays some deeper, darker currents. Hell’s Mouth lies on the southerly tip of Llyn Peninsula, overlooking the broader sweep of Cardigan Bay. 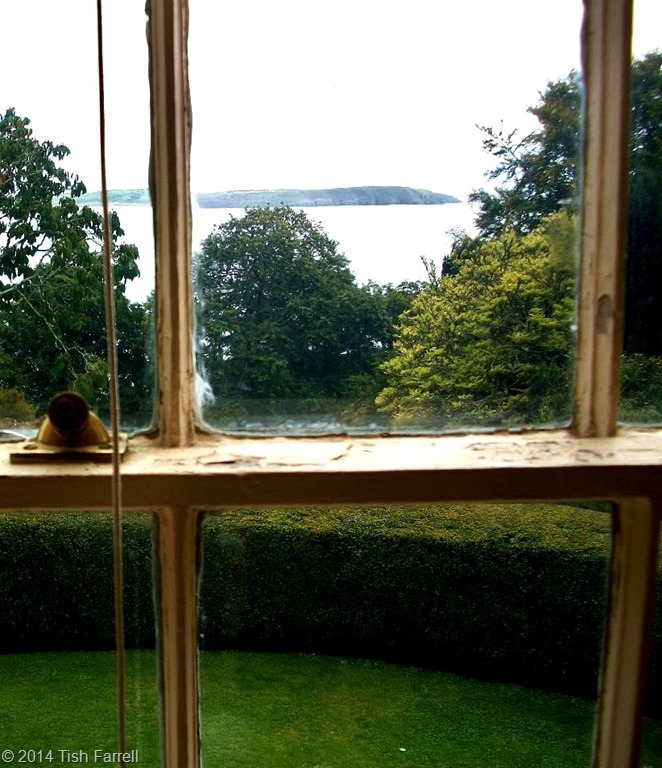 The calm view from Plas yn Rhiw is transfixing. How can it have such a name? Yet watch this space and see a different scene. For when the south westerly gales come roaring in, this bay becomes a death trap. Over the years it is said that some thirty ships have been run aground, their holdfast anchors dragging before the driving storm. Wrecks include the Transit that foundered with a cargo of cotton in 1839. In 1840 it was the Arfestone carrying gold. An Australian ship was lost there in 1865, and in 1909 the sailing ship Laura Griffith was wrecked. And there is more. Reel back to the 8-900s AD and Llyn was the scene of bloody raids. At this time the Vikings occupied coastal Ireland across the bay. 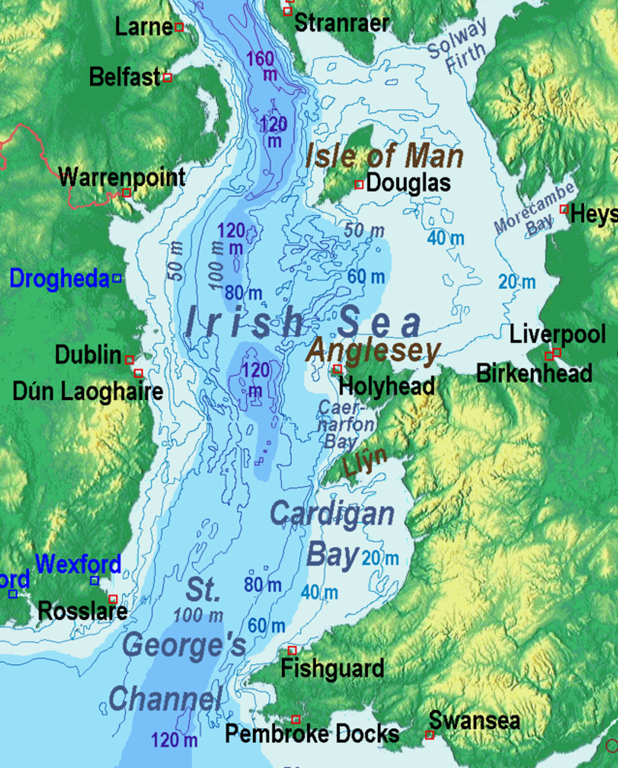 Llyn was then part of the Welsh Kingdom of Gwynedd and Powys and its prominent position made it seem an easy target from over the Irish Sea. The Welsh, under Rhodri Mawr (Rhodri the Great 844-878 AD) fought valiantly to keep the raiders at bay, although accounts of the time attest to their terrifying attacks. But whatever the truth, the sight of a raiding party, sixty five ships strong, and coming fast into the bay must have truly chilled the blood. By the 10th century Llyn was still holding its own against Viking incursion, but only through constant vigilance. And this is where Plas yn Rhiw comes in. Local history has it that Meirion Goch, great-grandson of Rhodri Mawr, was instructed to build a fortified house at Rhiw and hold the coast against invasion. It is also thought that this stronghold occupied the site of the present house, although no provable traces have been yet been found. 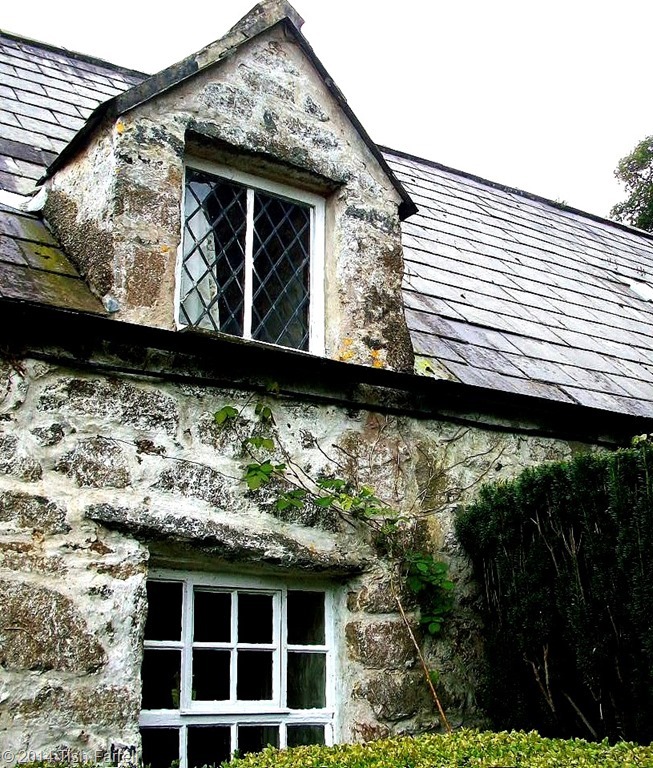 The descendants from this royal dynasty appear then to have occupied Plas yn Rhiw for the next thousand years, eventually adopting, in the English fashion, the surname Lewis. The Llyn Peninsula is the finger of land above Cardigan Bay. Hell’s Mouth is due north of the ‘d’ in Cardigan. The port of Dublin in Ireland was founded by the Vikings, along with other coastal towns that they used as raiding bases. (Map: Creative Commons). The house we see today, then, has its own stories – cycles of re-building, abandonment, decay, renewal. 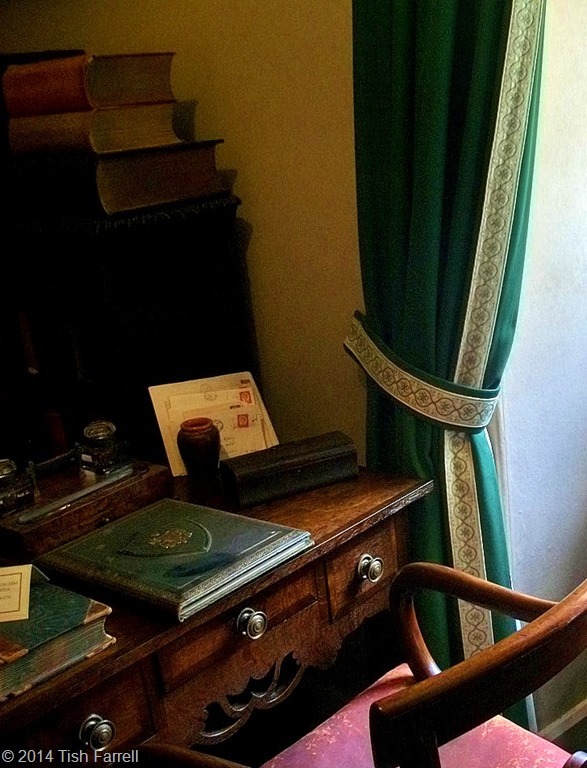 Now , as a National Trust property, it is frozen in time; as if its last elderly inhabitants, the Keating sisters, have simply popped out to the shops and left you to gaze upon their hats and gloves, and recently received letters. But more of these sisters in moment. First a quick history of the house. 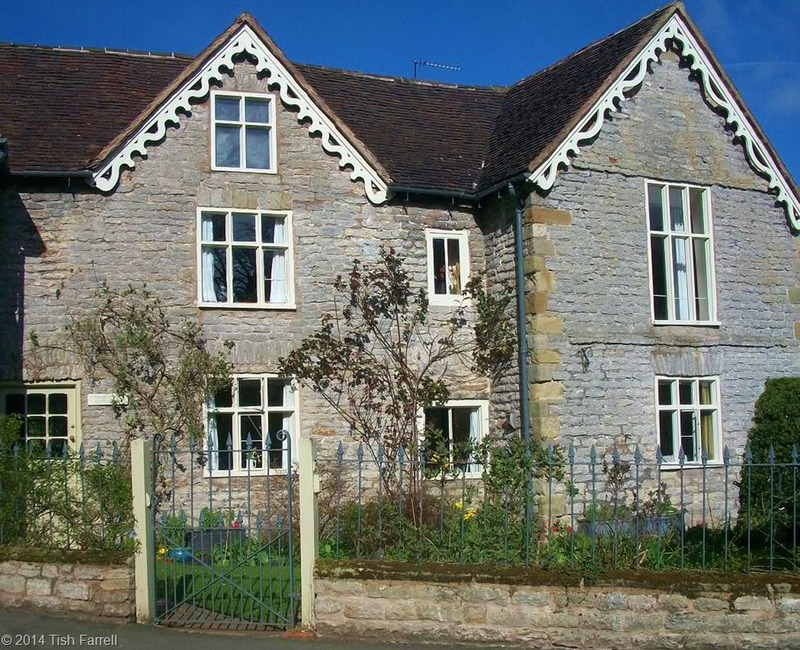 The lintel over the French window is carved with the date 1634, which probably marks the re-modelling of an existing medieval house by the then owner John Lewis. In 1820 the house was further extended and the grand Georgian facade and a further storey added. 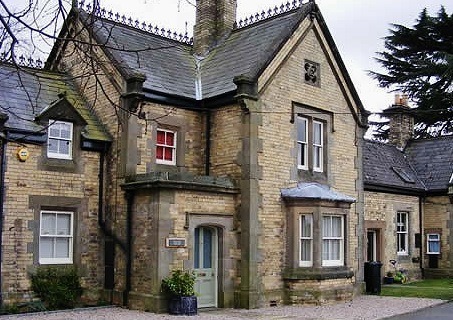 But in 1874 the long connection with the Lewis family ended and the house was sold for the first time in its existence. The new owner then let it to a succession of tenants, and it was possibly one of these, Lady Strickland, who created the gardens. She apparently also introduced the first bath tub to the district. And there is a tale of a ghostly visitation during her tenancy – a drunken squire roaming the house in search of a drink (lost spirits perhaps?). But by 1938, when the house was once more for sale, it was in a sad state of repair. 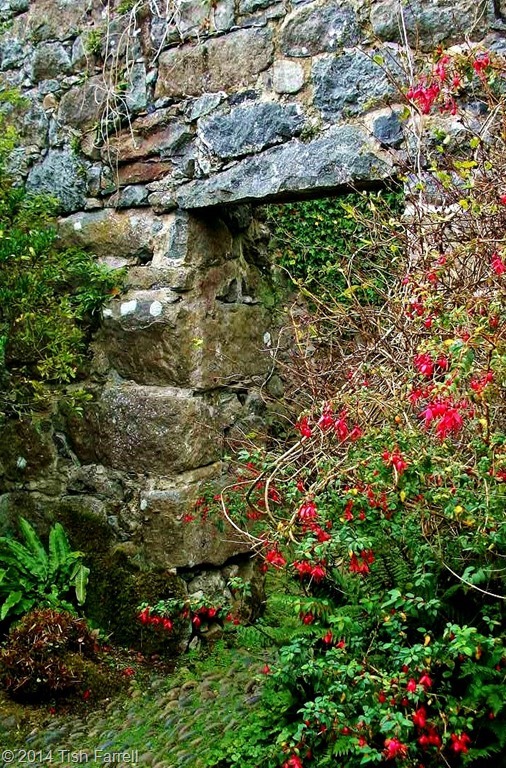 The nearby millstream had left its bed and was running through the hall, rotting the staircase, brambles blocked the front door and the garden was a jungle. 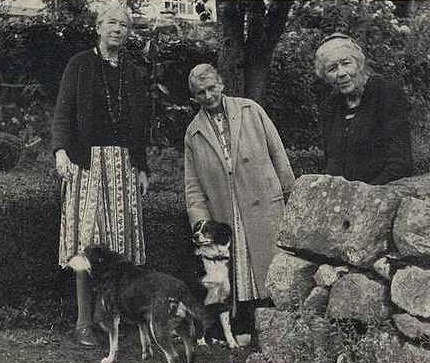 Enter the saviours, Welsh conservationist and architect, Clough Williams-Ellis (creator of Portmeirion ) and his friends the Keating sisters. The sisters bought the house, along with 58 acres of land that were all that remained of the original estate. 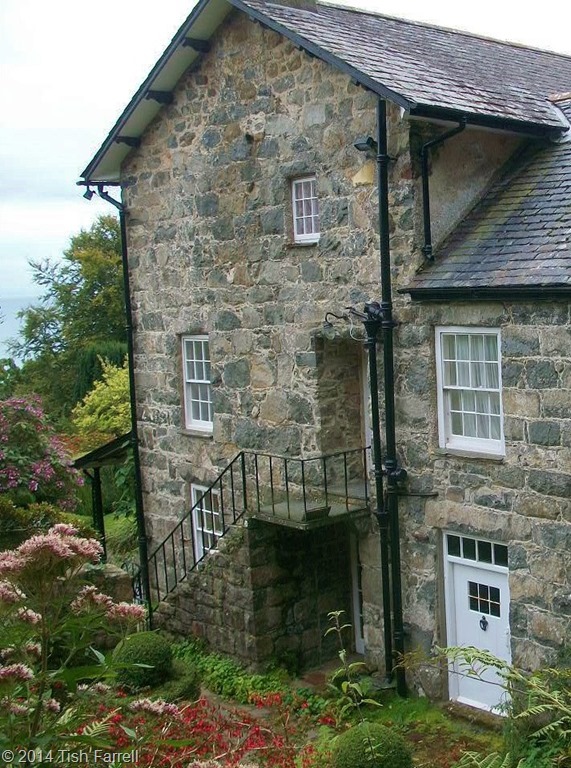 With Clough Williams-Ellis to help and advise, the restoration began, and the following year the Keatings moved into the house. They then set about buying back the estate’s former land, which they gave to the National Trust in 1946 in memory of their parents. The house was donated in 1952, although the sisters lived there for the rest of their lives, the last and youngest sister, Honora, dying in 1981. 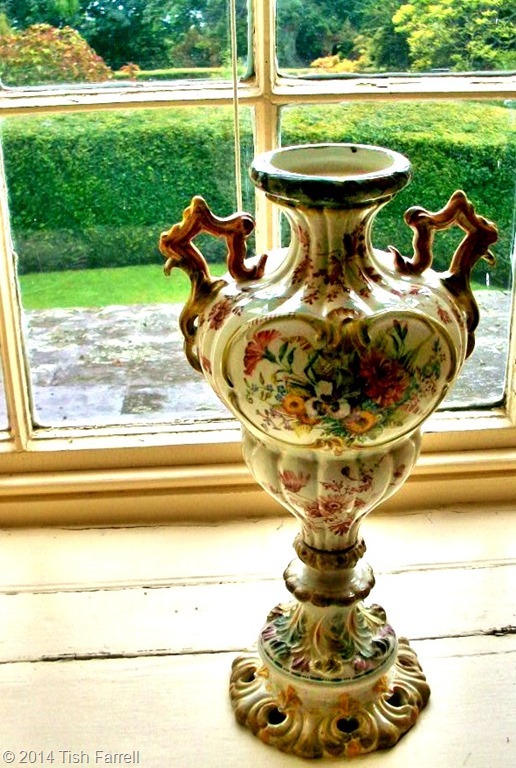 Inside, the house has no pretensions to grandeur, although it is filled with personal treasures – everything from fine Meissen figures to the cottage vernacular of a Welsh spinning wheel. 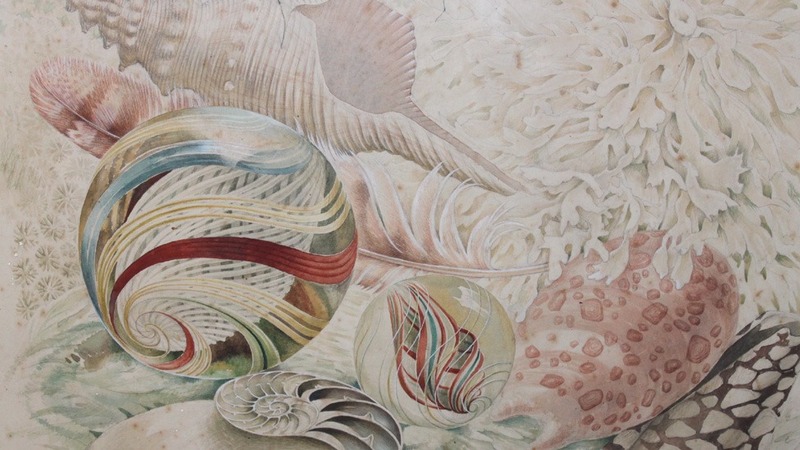 Along with the family portraits and antique furniture are paintings by Honora who studied at the Slade, and also works by M E Eldridge, the often overlooked artist wife of the poet R S Thomas. 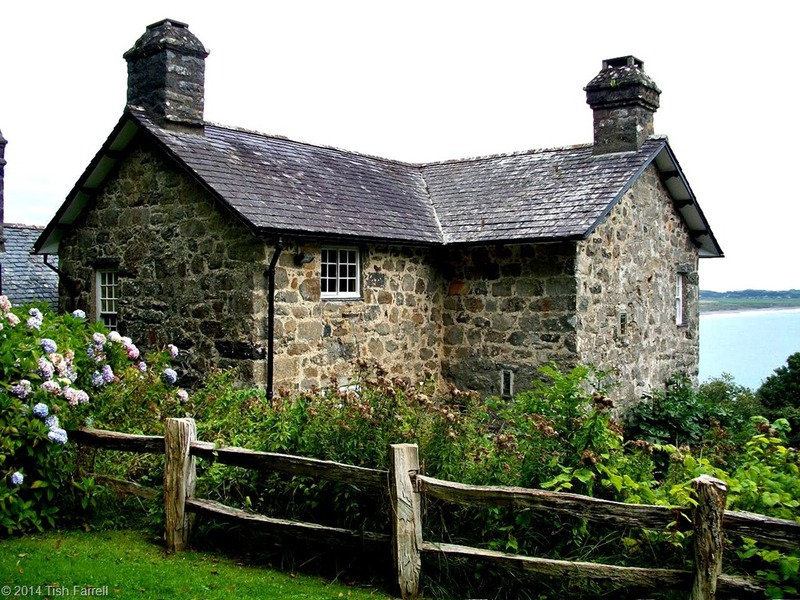 (When Thomas retired from being parish priest at nearby Aberdaron, the Keatings leased to him Sarn Rhiw, a stone cottage in the grounds below the house). 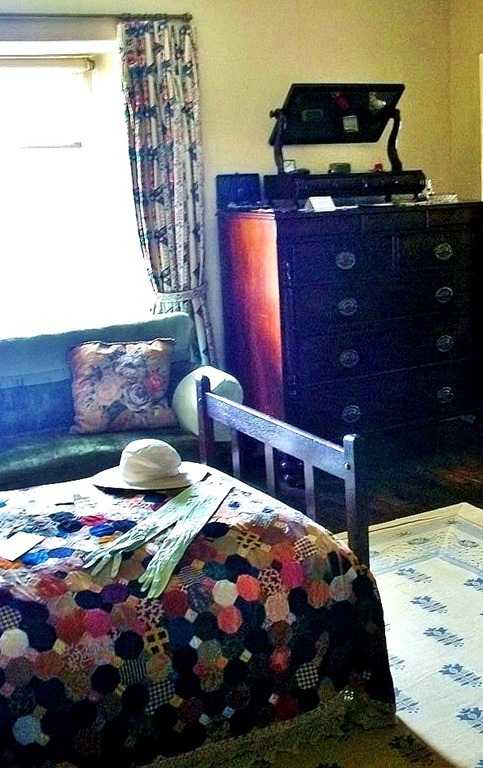 Honora’s room – alongside the Victoriana there is in the fireplace a c.1916 Royal Ediswan electric fire which operated by means of 250-watt bulbs. Beside the bed is an early Pifco Teasmaid. Kui wakes – a golden starburst in her head. When she opens her eyes the idea is there. 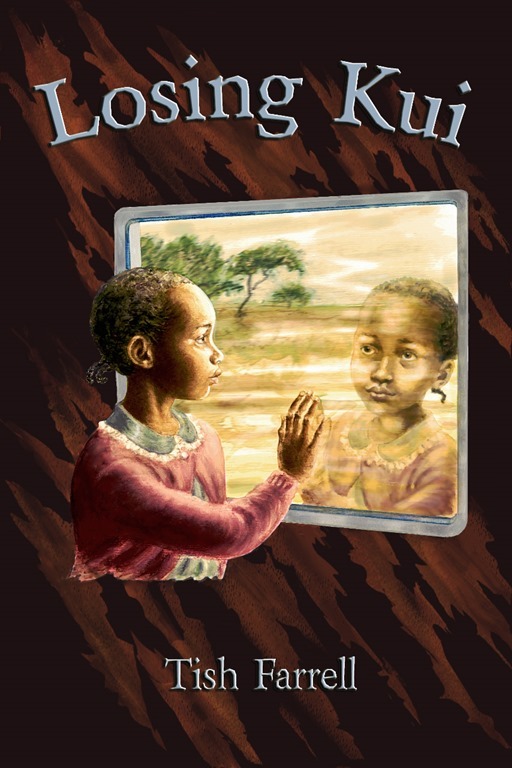 She does not know where it comes from, but it seems to have something to do with Baba, her Daddy Julius, whom she rarely sees because he works in the city, far away from their village. Thinking of Baba gives her a sickly, sinking feeling. Yesterday he came when she and Mummy were on their way to church. Kui spotted him first. 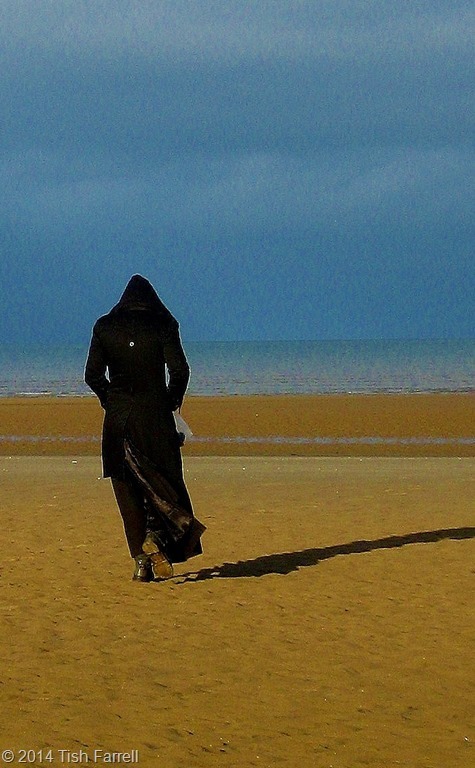 There he was, so smart in his dark city suit, picking his way up the muddy lane. She wondered why he did not have on rubber boots as she and Mummy did, or carry a brolly since it had started to rain again. She wanted to run and hug him, but Mummy gripped her hand more tightly saying, ‘No, Kui. Stay under the umbrella. You will spoil your best clothes.’ And then Baba was there, standing over her, but before Kui could open her mouth to greet him, he and Mummy were face to face, and it was all stabbing words and hard eyes. That did it. Kui tried to twist her hand free and run back to the house, but Mummy’s hand gripped like iron claws. Next Baba was shouting, ‘For God’s sake, Faith. I’ve come to see you, don’t you understand? I’ve spent good money on fares and now you say you’re taking the child to wail and pray all day. Well dammit woman, I’m going to the pub.’ And he did too, striding off in the opposite direction towards the village shops. Kui watched him go, picturing him stepping inside Jimmy Mwangi’s bar where she knew many of the village men went on Sundays. And so that was that. Baba had gone. No hello. No bye-bye. He did not even notice her new church dress that Granny had bought for her. For the rest of the day she kept thinking she had done something very bad. Pastor Benson’s loud shouting did not help. Sins came flocking round her head like swarms of biting flies, and the priest’s cries of Repent! Repent! sounded like curses. When she and Mummy came home from church it was nearly night-time, and the rain had turned to a misty drizzle. While Mummy made their evening meal, Kui took Mummy’s big umbrella and went back to the farm gate to wait. In the growing darkness she heard the frogs in the hedgerows pipe louder and louder, and the crickets chatter like crazy, but Baba did not come. She and Mummy ate their ugali and greens alone as they usually did, and then Kui went to bed. For ages she lay very still in her little room, listening out for him. Then the songs of bugs and frogs filled up her head and she stopped listening. ‘How can you be so irresponsible, Julius? At first Baba did not say much. Then he let out a roar that sounded just like Lois, Mzee Winston’s old cow, who often stood by their fence and bellowed like that when she was unhappy. Then the fight really started and Kui had to wrap her head in the blanket to shut it out. The next time she woke there was only the pounding rain and blackness and Baba snoring loudly next door. Now, though, there is light at her window and she is wide awake, the idea shining like the Wise Men’s star. She will go and live with Granny. Then she will never again wake up to find a stranger-ugly-Mummy leaning over her bed with swollen eyes and crusty blood on her lips. Also if she stays with Granny, Baba will stop hurting Mummy, and Mummy can come on the bus and visit her at Granny’s house. Kui’s heart flutters like a small bird against her ribs. She must hurry. Already Jo-Jo the cockerel is crowing good morning on the shed roof. Any moment Mummy might come to help her dress. But she does not need help, does she? She is a big girl now. Soon she will be going to school. Granny will take her. She slips out of bed, shivering in her vest and pants, and quickly pulls on the church frock she was wearing yesterday. She cannot reach all the buttons, but never mind. Granny will say Ah! My little princess, as soon as she sees her. The pale blue satin is soft as silky sky and the net petticoats float like clouds around her legs. As she pulls on the long white socks and fastens the straps on the patent shoes she thinks she is just like Cinderella going to the prince’s ball. Then she spots the big pink cardigan on her shelf. Granny made it for her birthday, along with the matching bonnet with its big fluffy tassel. She puts them on. Next she wonders how to leave the house. She can tell from Baba’s snoring that he is on the sofa by the front door. If she creeps by on tiptoe he will not wake, but she doesn’t want to smell his breath. She turns to the window. One bar of the thief-grille is broken. It is wide enough to squeeze through. She climbs onto her bed and opens the window, then hitching up her skirts, wriggles through, and climbs down onto the wooden bench outside. Pleased at her escape, she waves at Jo-Jo, puts her finger to lips (Ssssh), then jumps lightly into the mud that make ugly splashes up her socks. Oh dear. She rubs the stains worse, then skates off down the rain-soaked path. She is glad she has on her best church shoes instead of the ugly rubber boots. The slippy soles are good for mud-skating, and Mummy is not there to tell her off. Out on the lane it is foggy, but the rain has gone. She passes no one, although there are some big boys climbing the mango tree outside Mzee Winston’s gate. Then down at the corner by the tea collecting shed she sees the minibus Joybringer taking on passengers. She knows it is Joybringer because it has golden rain round the back window and Mickey Mouse is waving to her. She also knows that this is the bus that she and Mummy take when they go to see Granny. While the tout is on the roof tying down a bicycle, she slips aboard, dodging between a mama with a basket of eggs and a man waiting to load a large iron roof sheet. She worms her way through the forest of legs and bundles to a corner space on the back seat. She has no money for the fare, but she will tell the tout that Granny will pay when she gets off. Also, she is not sure which stage to ask for except that Granny always meets them at the big shopping centre past the coffee farm. Kui looks forward to that bit of the journey. The shop by the bus stop has beautiful pictures of black and white cows painted on its walls, and Mummy tells her that the pictures are there so everyone can know it is the butcher’s shop, even people like Kui who cannot read yet. Granny will be waiting by the cows, and when she sees Kui she will cry, ‘See what joy the Joybringer brings me’ and give Kui a big hug. 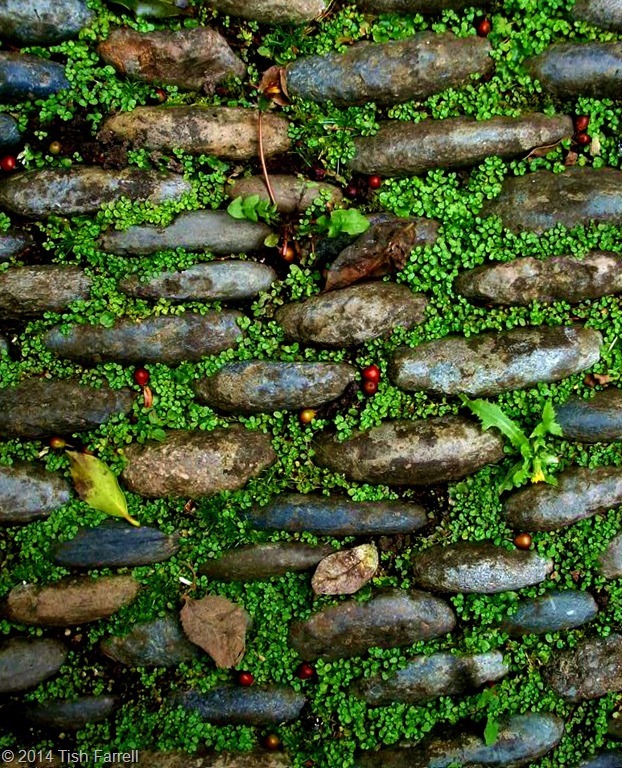 Then they will go hand in hand down the windy track to Granny’s little wooden house, and Granny will stir the coals on her hearth of three rocks and make the special porridge that she always makes, and give Kui a big cup of milky, sweet tea from her thermos flask. Kui licks her lips, then hugs herself with excitement as Joybringer speeds off through the village. How glad she is to be visiting Granny. How grown up she is to be travelling on a bus all by herself. Even as daylight sifts through the bedroom curtains, Winston Kiarie knows there is something wrong. The worry that has haunted him for weeks now roots like a jigger under a toenail. All night he has lain awake, listening and wondering – on and on, as the clock ticked off the hours. All night the rain has burst like gunfire on his iron roof, boiling out his gutters, threatening to explode expensive window glass. In the black hour before dawn, with Rahab snoring beside him, he finally understood the meaning of water on the brain. He had it. Lying there in his own bed, trapped like a man inside a waterfall – the drenching, drumming deluge. Where did such rain come from? Never in his long life had he known weather like it, the short rains becoming long rains, the long rains forgetting to stop. And in the darkness Winston found himself muttering, ‘Yes. Yes. It’s what I thought. Some even say it’s the end of the world.’ This thought made him tremble, and quickly he probed the dark for more rational explanations. Fear, he knew, always loomed largest at night. The jigger was probably exaggerating. By day its pronouncements might not seem so ominous. Yet with the dawn Winston finds that the word ‘unnatural’ still running round his head. He watches the curtains lighten by degrees. Hears the rain stop hammering, but still the fear is there. Sighing, he hauls himself from the bed where Rahab still snores, gently tucks the blanket round her. Not even the jigger fears can put off the morning routine: a trip to the latrine, milking, then a big mug of tea. Through the crack in the curtains he can see that all is greyness out in the yard. He struggles stiffly into pants, shirt and the bright blue pullover that Rahab made for him in the days when she could still conjure knitwear from two steel pins, a fat ball of yarn and some secret inner vision that he could never fathom. At the kitchen door he pulls on the old English sports coat, up-ends and shakes his rubber boots before putting them on (so clammy on bony old feet) then, unbolting the door, steps into the yard. Outside, his hands fly skywards. Thank Ngai. No rain. Only wet mist, and that at least is seasonal. 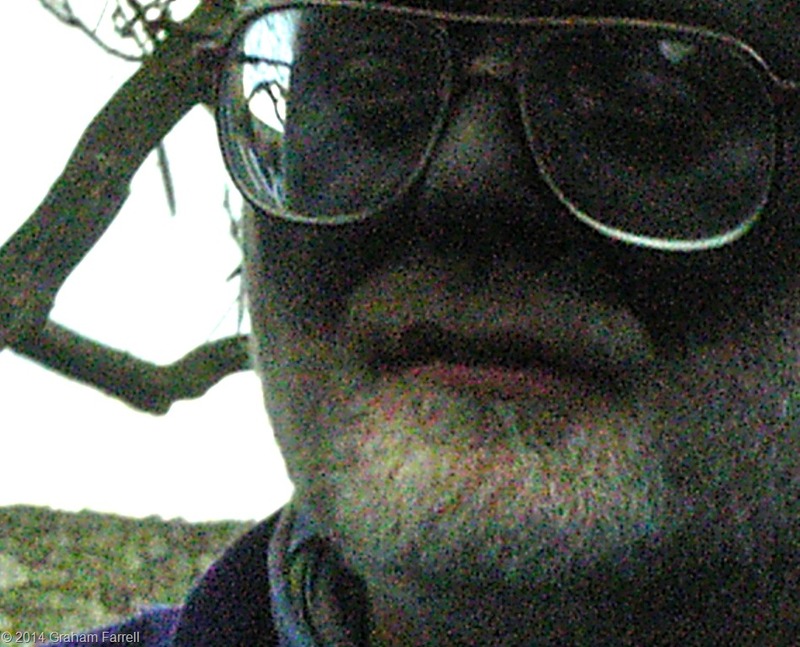 He slip-slides through farmyard mud, heading for the path to the long-drop latrine. In the slow-going he thinks that, at their age, he and Rahab could probably do with one of those modern indoor bathrooms that may be found in smart hotels. But then it would be costly to build, and the drainage hard to manage with the farmhouse perched as it is above the Great Rift. Besides, the long-drop is conveniently downwind; it serves well enough if it is dug out regularly, although the thought of this chore makes him sigh. Like much else these days, such jobs get no easier. Shunting across the yard, his boots are soon so caked with mud that they are hard to lift. This gives him the oddest sense of moving forwards only to slide back to where he started. For a moment he stands still to check progress and, glancing back to the kitchen door, suddenly sees the funny side. Ha! Moving forward to slide back? Sounds like some joke government slogan. Well, isn’t that how life is now: everyone striving, but then ending up worse off than before? He must tell Rahab over their breakfast cuppa. Even she will see the humour of it. At least he thinks she might. Yes. Moving forward to slide back. What a joke. He stops at the cattle pen to scrape the excess mud from his boots. At this rate he might never reach the privy in his lifetime. Two Ayrshire cows and three Jerseys push their faces at him over the fence. Five lots of breath make white plumes in the mist. Winston briefly pats each dewy nose in order of seniority: Lois, Lola, May, Primrose, Mumbi. All present. All correct. And yet? He turns and looks around the farmyard, scanning the acanthus hedge where the fog hangs in shrouds. But it is not the fog that disturbs him; it is something else. It is silence. Not even a dove or starling calling. After the night’s thundering rain so much quietness is uncanny. He thinks of Rahab then, and wonders if she is awake yet. She sleeps so much these days; not even last night’s din disturbed her. Sometimes she seems to slip into another world, as if she is submerged in an old-age, silent fog all her own. He wonders if the endless rain is to blame (water on the brain?). All he can do is hope that she will come back to herself. He presses on slowly across the yard, telling himself that he is not the only one to be worried by weather. Two days ago, during a lull in the rain, he and Rahab walked to Ingigi’s general store. They needed tea and maize meal. Along the lane the lantana bushes steamed under a misty sun, and people stopped to commiserate over the general quagmire. Not everyone was complaining though. Outside their neighbour’s Faith Muthoni’s place little Kui and another child were playing shop. 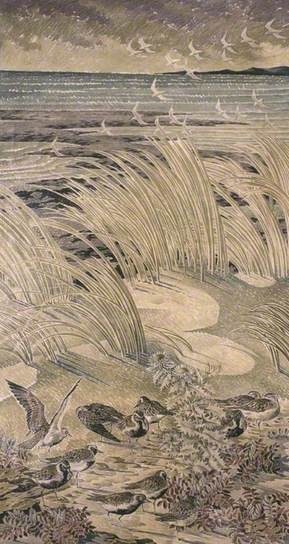 They were having a fine time shaping rounds of mud and mango leaves, and setting them out on a banana leaf. ‘Mud pies,’ Kui cried when she saw them. ‘I will give you a good price.’ Then she dissolved into shy giggles when Rahab sparked into life and ordered ten. Winston at once repeated the order, trying to join in the children’s fun. The only problem was he could not be sure if Rahab was joking. Further on at the market crossroads they found a big crowd trying to shunt Joybringer out of the mudslide that had spilled down the plum orchard above the bus stop. While the windows sparkled with old Christmas tinsel and Mickey Mouse grinned like a mad thing, tempers began to fray. City-bound travellers were suddenly sprayed in mud from a spinning back wheel, and this was the moment that Sergeant Njau turned up and tried charge the bus driver for causing a public nuisance. It was very poor timing on the sergeant’s part. Also Winston was astonished to learn there was such a crime. But Sergeant Njau had pressed his luck too far this time. The passengers, furious that any fine would be added to their fares, turned on him. The officer, faced with a mob of such unexpected ferocity, muttered something about ‘mitigating circumstances’, and quickly retreated to the Police Post. Meanwhile Jimmy Mwangi, the local bar owner, caught Winston’s eye. By then Winston wished that he and Rahab had stayed at home, away from such alarmist forecasts. Even when they reached Quality General Store, Mrs. Kuria wailed that there had been no maize meal delivered and surely God was sending an absence of ugali to punish them for their wicked ways. Winston could summon no suitable response to this either. Now, though, he thinks the doom-mongers may have a point, but only so far. God, he is sure, is not the culprit. Recently he has been reading the newspapers more carefully. He has learned, for instance, that the felling of the highland forests is changing the Rift Valley’s climate, lowering the water table, and loosening the light tropical soils so that they wash away with every rainstorm. On top of this, everyone knows that officials have been plundering the valuable hardwoods for years, and then clearing the rest for charcoal burning and bhang farming. And so, with the sacred soil thus exposed, El Niño strips the land as a slaughterman flays a carcass. He knows where that soil ends up too. He discovered this quite by chance, three weeks ago when he called in at Jimmy Mwangi’s for a glass of home brew, something he did not usually do. As he stepped into the bar, there on the T.V. was a scene that stopped him in his tracks. An aeroplane was flying over the Tana Delta, and filming the vast red slick as it spread into the Indian Ocean. It did not take him long to realize that this was the outpouring of their very own river that rose in the High Rift hills; their own good earth flowing into the sea. The image of a severed artery sprang to mind. He began to feel faint. And that is when he knew. The homeland he had fought for in his youth was simply bleeding to death – kwisho and bye-bye. He turned on his heel and went home without ordering the drink. Even now, recalling that scene gives him a stabbing feeling in his guts. He hurries onwards. When he reaches the drier ground of the hillside path he strides out, sidestepping the chickens coming the other way. (How the devil have they got out?) But there’s no time to think about that now. He throws back the wicket gate at the end of the path, takes the long-drop key from his trouser pocket, and steps into the field. But as lifts his hand to the place where the door should be, he finds there is no lock to open. No door either. Winston’s hand hangs in space. The latrine is gone. The ground it stood on too. Nothing left but a bloody mud slick. It takes another second to sink in. Ngai, help him. Now he knows what the jigger meant. His life’s work is gone – the plots of coffee, tea, maize, the terraced banks of cattle grass – all swept away by a massive landslide from the hills above. Only the red subsoil remains. And something else. A big rusty egg lying in the dirt where the latrine should be. Winston drops his trousers just in time. Dear Lord. Then finishing fast, he runs to warn Rahab. He knows what that giant egg can do. Forty-four years it must have been lying there on his farm. Forty-four years waiting to blow. YOU DON’T NEED A KINDLE READER TO READ OR DOWNLOAD E-BOOKS. Things are going from bad to worse in Ingigi village. 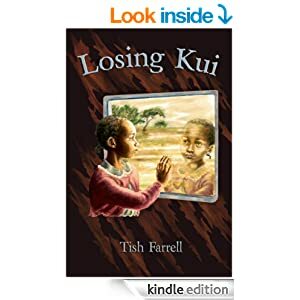 No one knows why five-year old Kui has gone missing. Nor does Sergeant Njau want to find out. He has his own problems, pressing matters that are far from legal. Then there is the endless rain. Will it never stop? Some Ingigi folk think it means the end of the world. Old man, Winston Kiarie, has other ideas. He senses some man-made disaster, and when it happens, it is worse than his worst imaginings. The fierce storms are causing landslides and throwing up British bombs, unexploded for forty years. Their discovery is giving the Assistant Chief ideas: how to make himself very rich. And then there’s young Joseph Maina and the primary school drop-outs thinking they have found treasure, and about to do something very foolish. Meanwhile, is anyone looking for Kui? Place the fruit in a heavy based pan, add sugar and simmer on low heat for 10 minutes until the fruit begins to soften. Add water and increase the heat slightly. Cook gently for a further 15 minutes until the fruit is completely soft. Leave to cool then strain through a sieve, pressing the pulp into the syrup. Add lemon juice and store in the fridge. 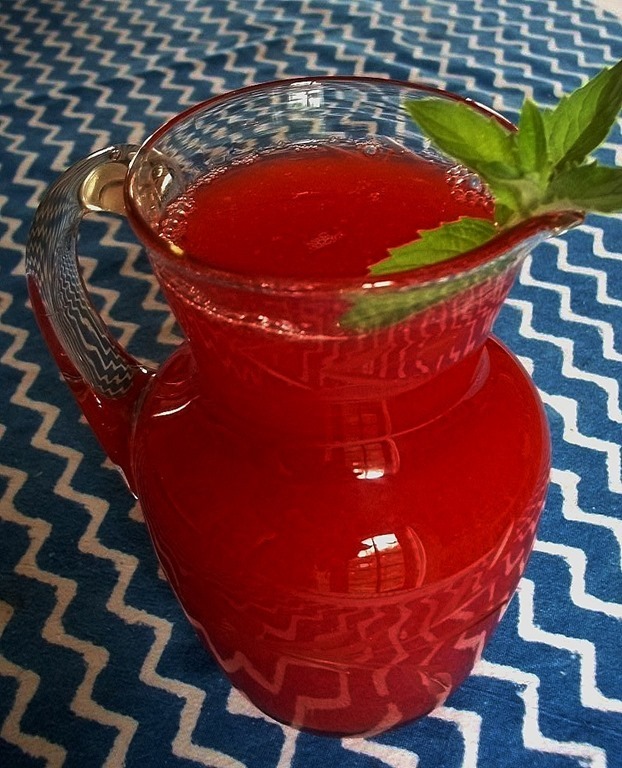 For non-alcoholic moments, dilute with chilled sparkling water, and add a sprig of mint. 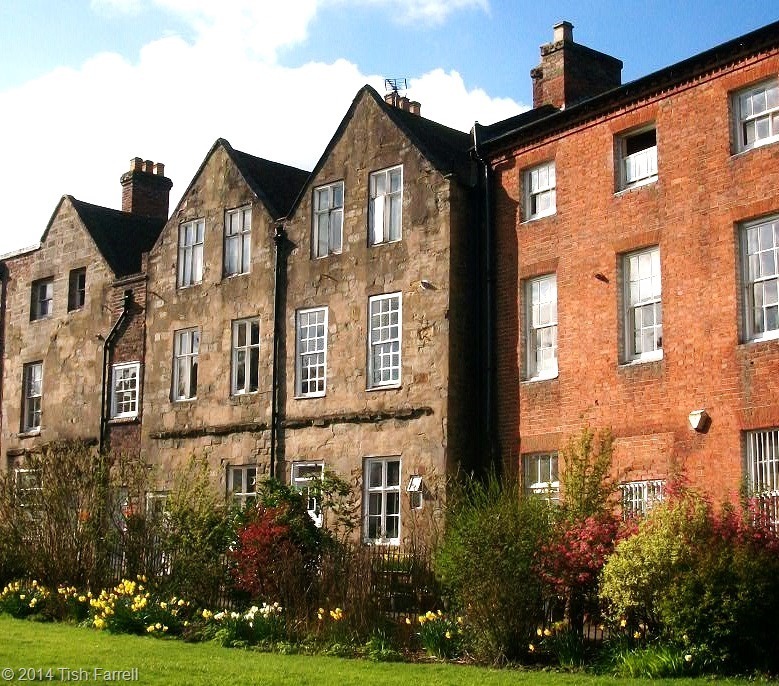 This is the house where Henry James stayed on his visits to Much Wenlock in 1877, 1878 and 1882. 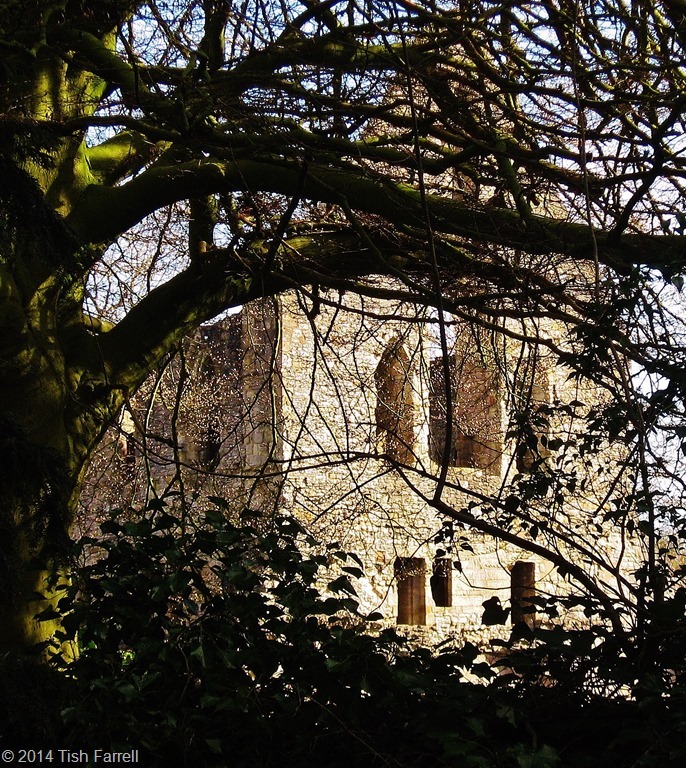 At the time it was known as The Abbey, but once it was the Abbot’s House, and part of a great medieval Cluniac priory whose ruins stand beside it. 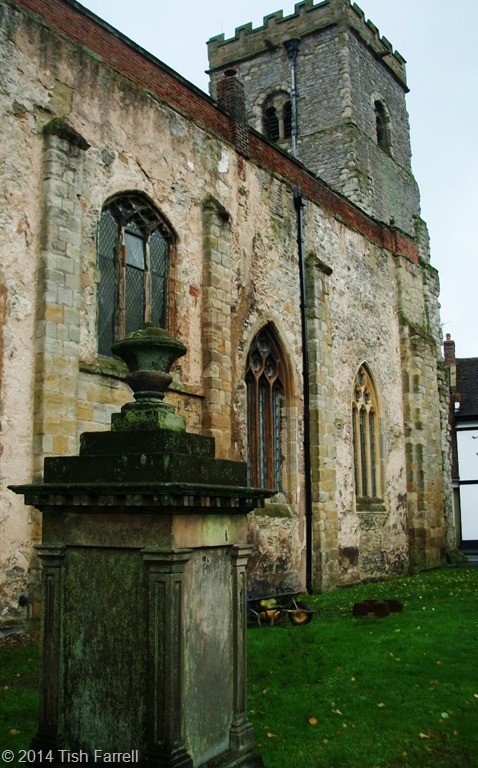 Only the house, and the town’s parish church survived Henry VIII’s great monastic dissolving campaign of 1540. I’ve recently read, too, that the Dissolution did in fact involve actual structural ‘dissolving’. 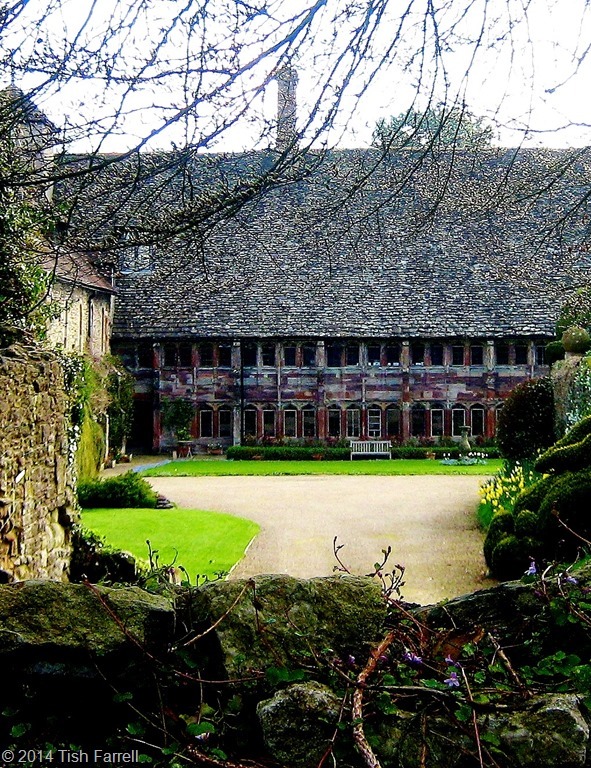 The first thing King Henry’s agents did in their bid to disempower the clergy and seize their estates was to rip the lead off the monastery roofs. The wear and tear of English weather then did the rest. Since Wenlock Priory was once one of the most imposingly large religious houses in all Europe, you can well see how efficiently the elements did their work. 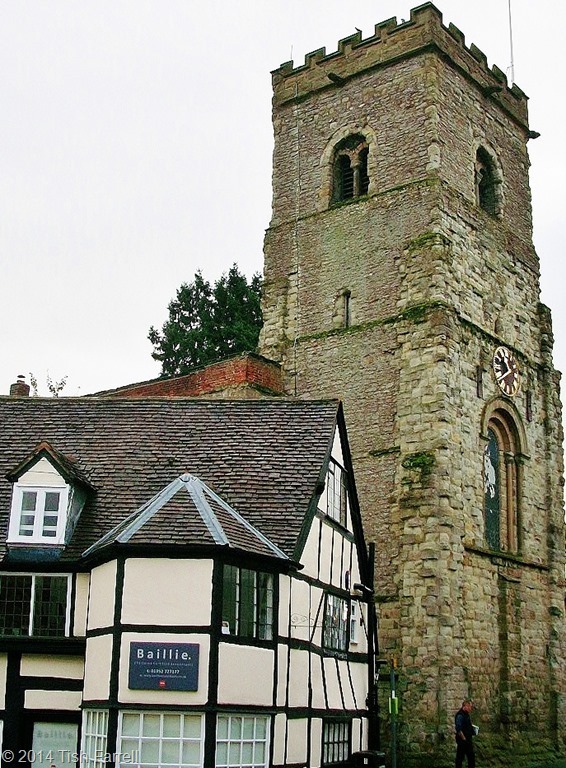 The adjacent small town of Much Wenlock town dates from at least from Saxon times when St. Milburga, daughter of a Mercian king, founded the first religious house here. 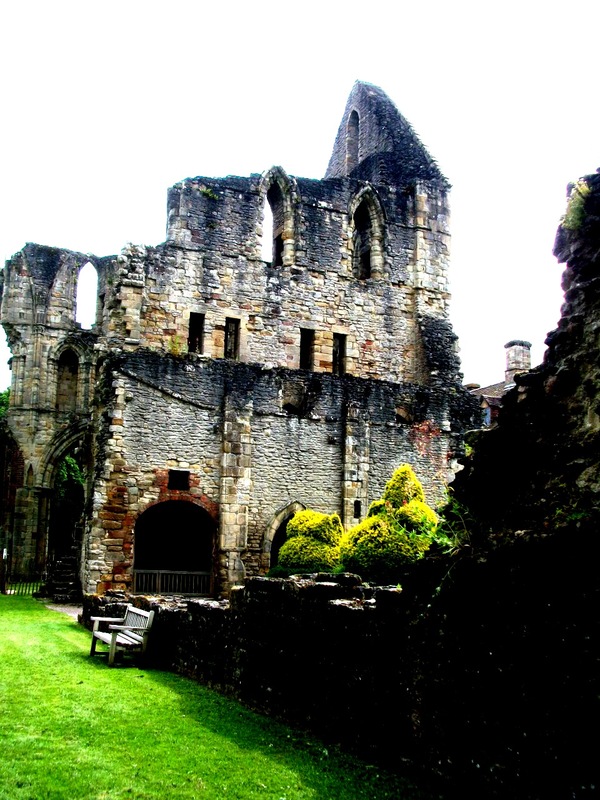 She was Abbess of Wenlock between 675-690 AD. The later priory was the work of the invading Normans, who liked to use looming architecture to cow the natives into submission. The monks were brought in from France, but it wasn’t until end of the 12th century when Bishop Odo, a former Cluniac monk, published his account of the discovery of St.Milburga’s bones (he describes them as “beautiful and luminous”) that this great house acquired the kind of saintly cachet that ensured serious pilgrim-appeal, and thus brought much prosperity to the town. 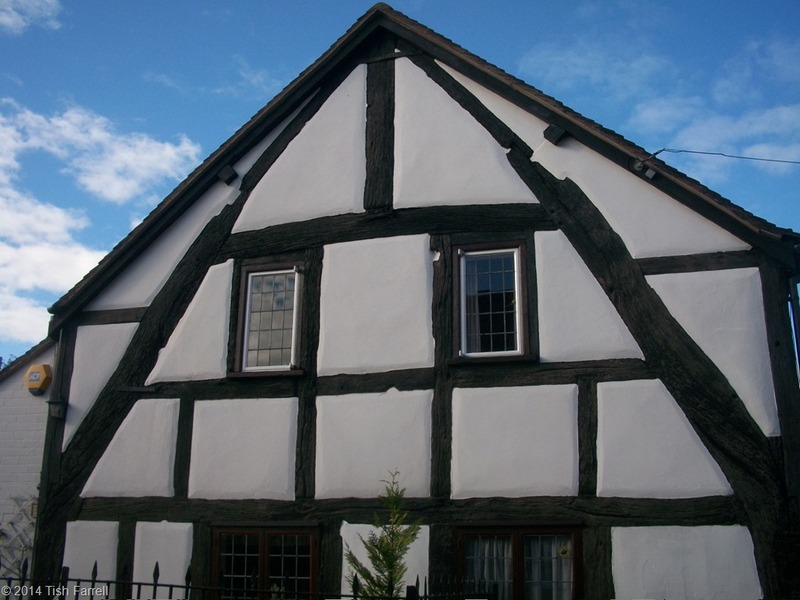 After the Dissolution, however, pragmatism ruled, and much of the fallen priory masonry was used to build or expand the town’s homes and businesses. 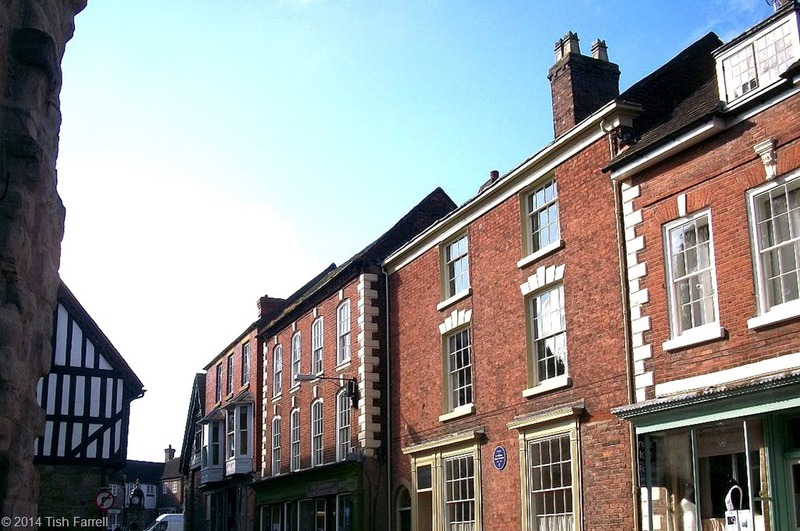 Thereafter, Much Wenlock’s success was based on providing a small but busy mercantile and manufacturing centre for the local agricultural and quarrying community. It even had two Members of Parliament. 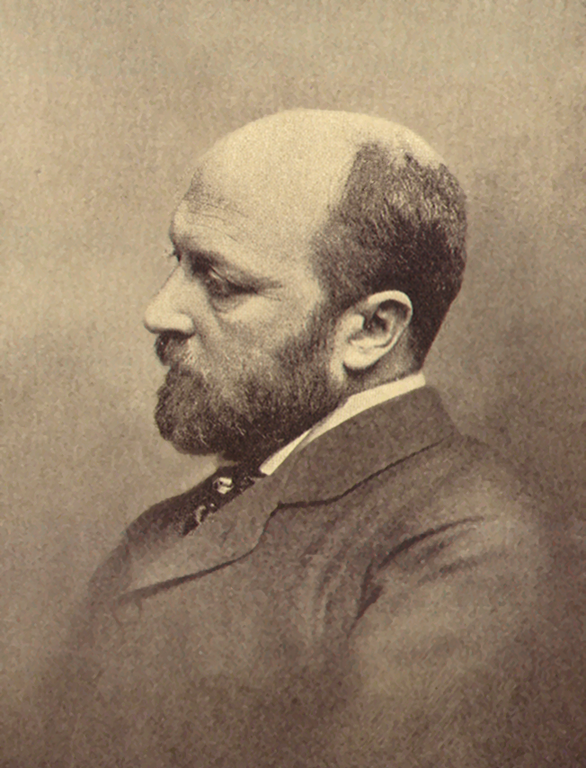 But back to Henry James (1843-1916). 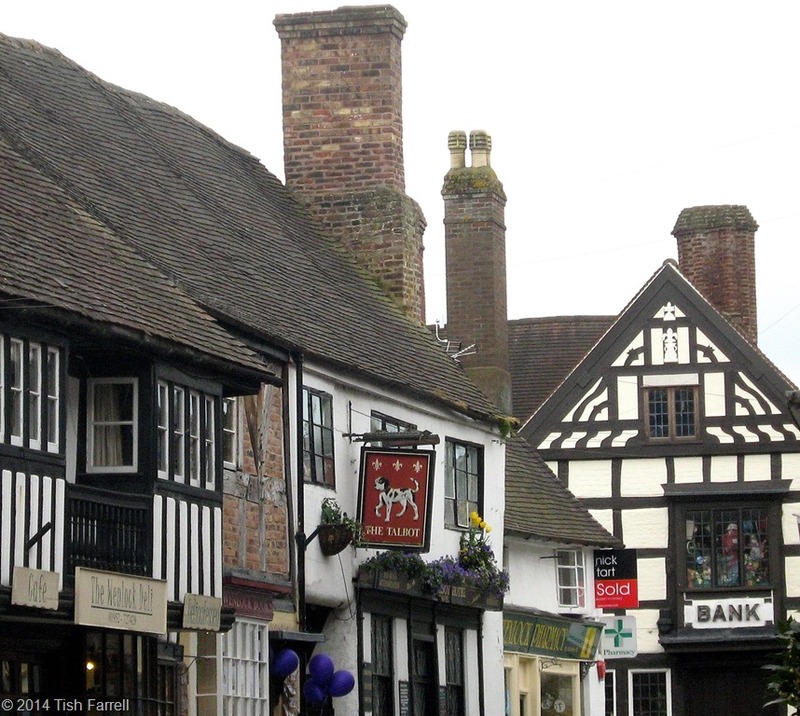 What on earth had brought this widely travelled writer to the little town of Much Wenlock? And not once, but three times. 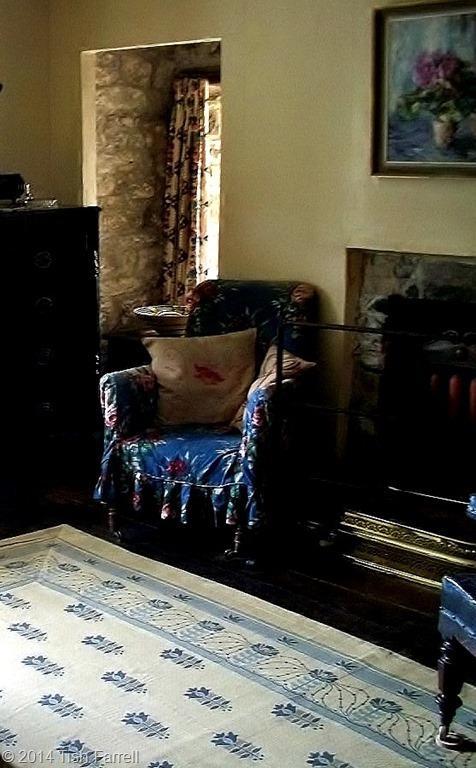 And so, further enticed by “a gracious note from Lady Catherine Gaskell” and armed with a copy of Murray’s Handbook of Shropshire, Cheshire and Lancashire, Henry James left London for deepest Shropshire, travelling by train to Much Wenlock. The details of how he spent his time on his five-day visit appear in a travel sketch called Abbeys and Castles, later published as part of Portraits of Places (1883). …with the priory ruins on the left. 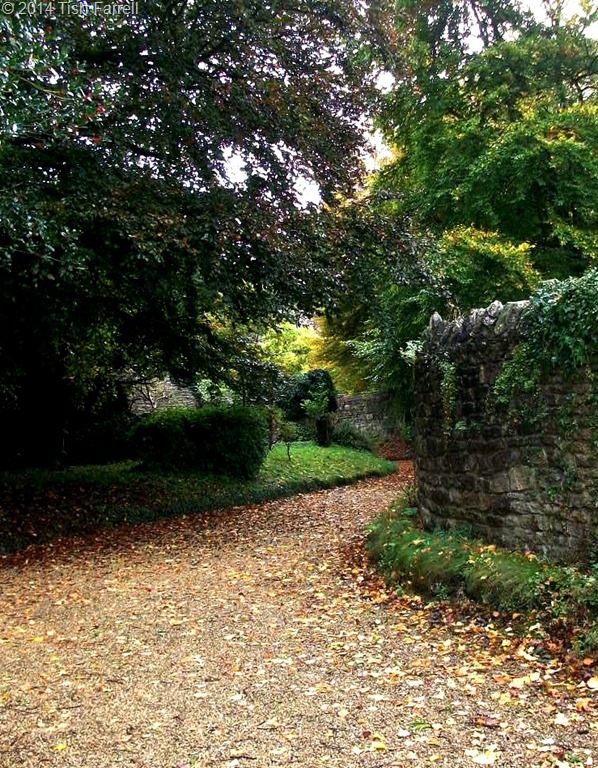 The carriage would then have swung hard into the open courtyard of the Abbey, and this would have been Henry James’ first view of his destination. Well-travelled as he was, I think he would have been astonished. Things have changed of course, although we still have a fair few ‘publics’ for so small a town – five in fact. But there are no longer little girls who curtsey to gentleman, and sadly no railway, which means instead we do now have the inevitable din of vehicles..
An interesting aside to the Henry James’ Shropshire travelogue is that he is said to have been working on his disturbing ghost story The Turn of the Screw while staying at the Abbey. He certainly had the supernatural on his mind during that first visit. 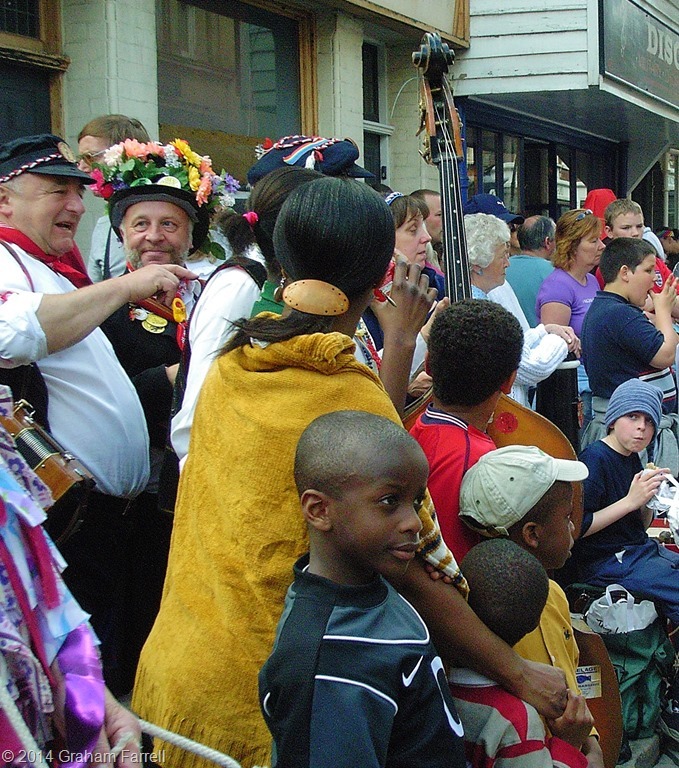 There is much that is unexpected about Rochester’s annual Sweeps Festival, held every May Day for the last thirty four years. 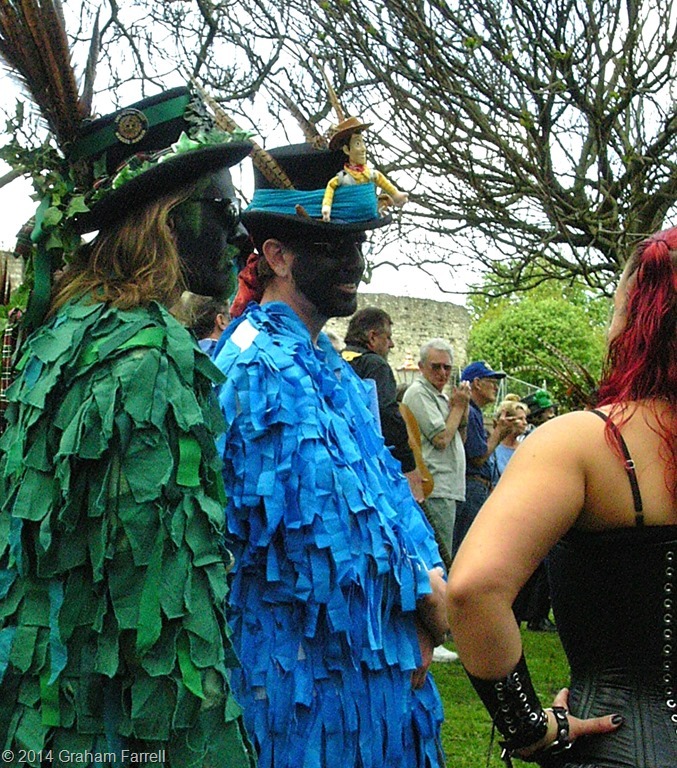 It is of course a re-make of a much more ancient festival – one at least 400 years old, and that in turn was probably a re-make of various spring-time rites from distant antiquity. 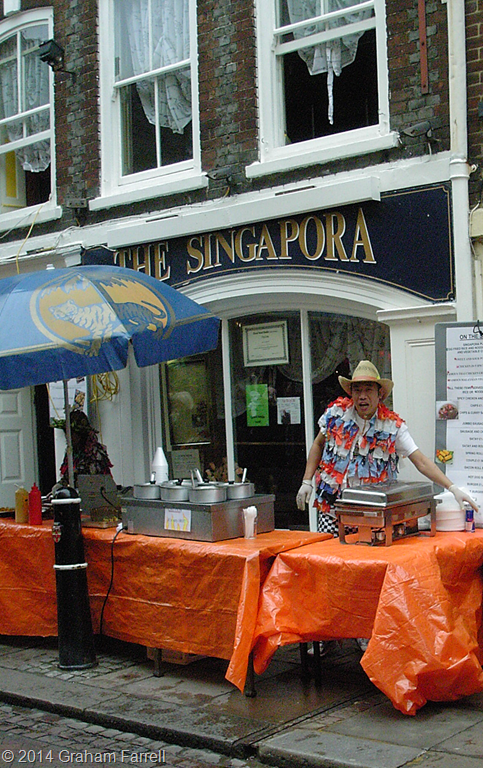 As you scan down the photos you may notice a plethora of cultural references, some of them wholly inexplicable, but all thrown in – in the name of jolly good English fun. 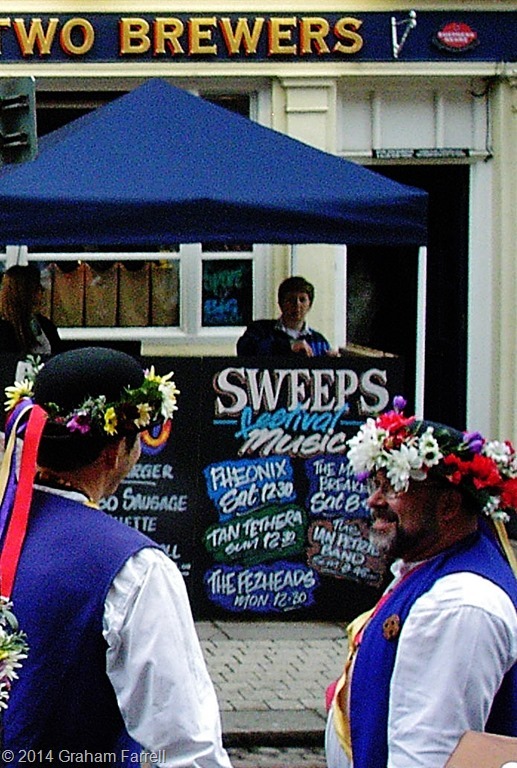 But first a bit of real history, at least to explain the ‘sweeps’ bit of the proceedings. In Britain chimney sweeping was once big business. Until the Climbing Boys’ Act 1868 which made it illegal, children as young as four were employed by Master Sweeps to clean inside the nation’s chimneys. This practice was even officially sanctioned. The Master was paid by parish officials to take on climbing boys (and sometimes girls) as indentured apprentices. They then underwent a 7-year training, after which, if they survived, they could become journeymen sweeps and work for a Master of their own choosing. The children were usually workhouse orphans and paupers, and the aim was to launch as many of them into the trade and up sooty flues so as to reduce their cost to the parish. It was a filthy, dangerous and vicious business, and you can read more about it HERE. 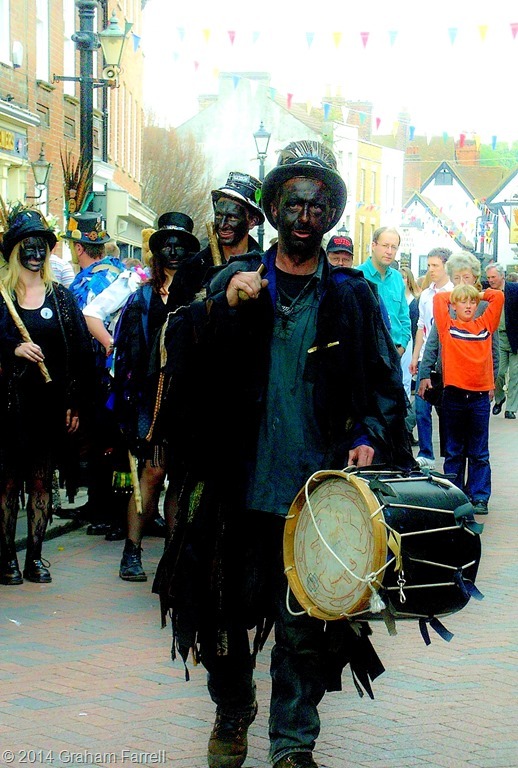 May Day was traditionally the only day of the year that chimney sweeps had as a holiday. 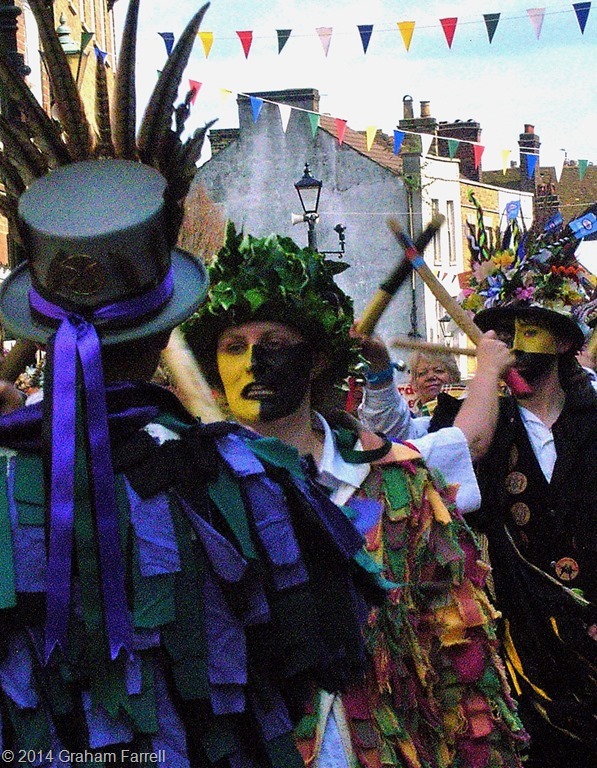 Here in Kent the day’s festivities traditionally began on Blue Bell Hill, at Chatham just outside Rochester (a hill also known for its Neolithic chambered tombs). 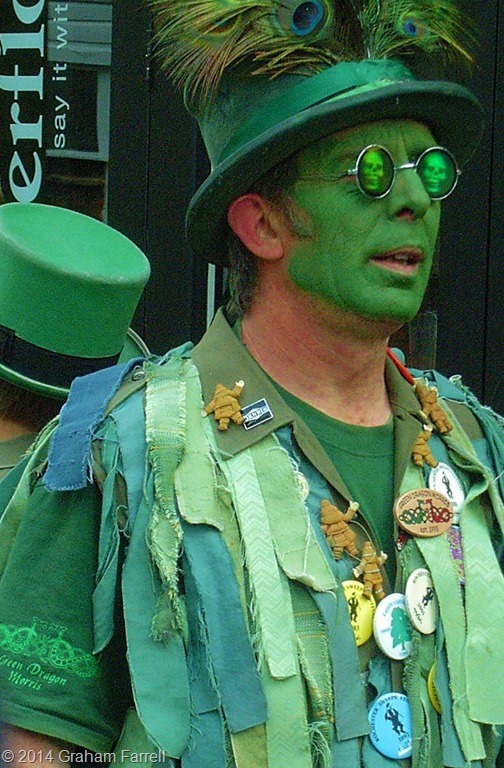 At dawn the merrymakers would awaken the giant Jack-in-the-Green who would then accompany them in the parade. 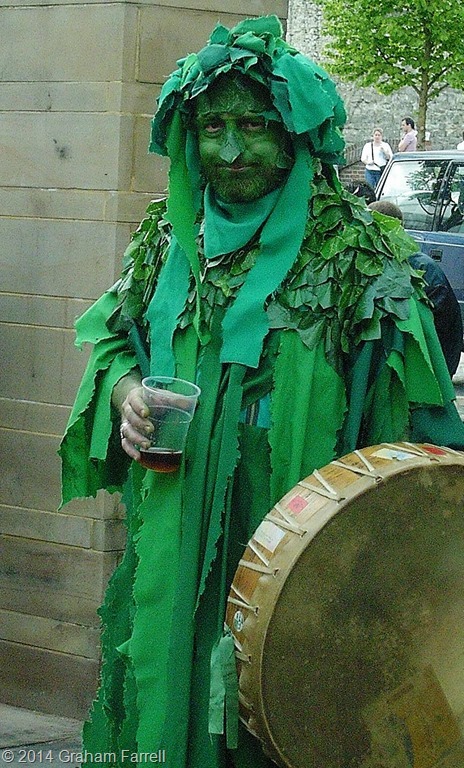 There are of course obvious references here to the Green Man, the Green Knight and various symbols of tricksterism and fertility. 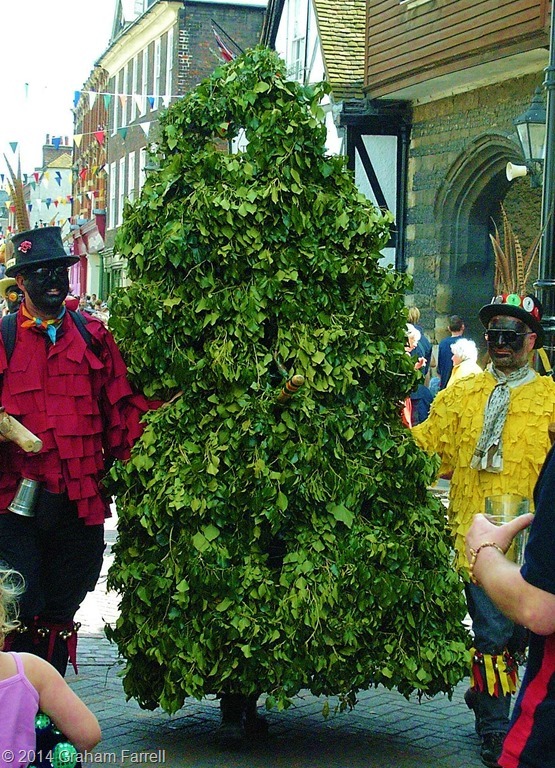 There are also similar festivals involving tree-figures in Europe, particularly Switzerland, and it is possible that some of the notions associated with these carnivals go back to Stone Age times. 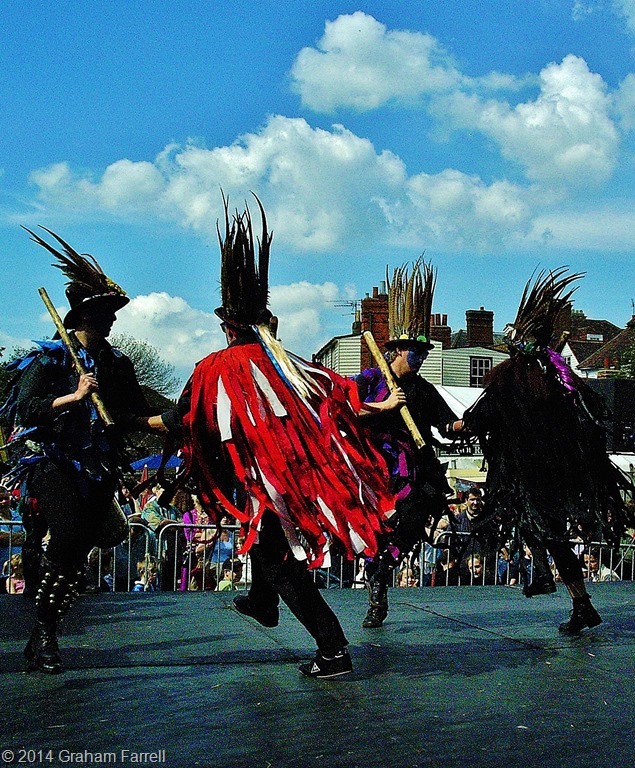 Welded onto all of this is the ancient English pastime of Morris Dancing, a form of folk dancing that has many regional expressions, and dates back to at least the 15th century. It had a great revival at the start of the 20th century when folklorists such as Cecil Sharp set about documenting traditional dancing and music. 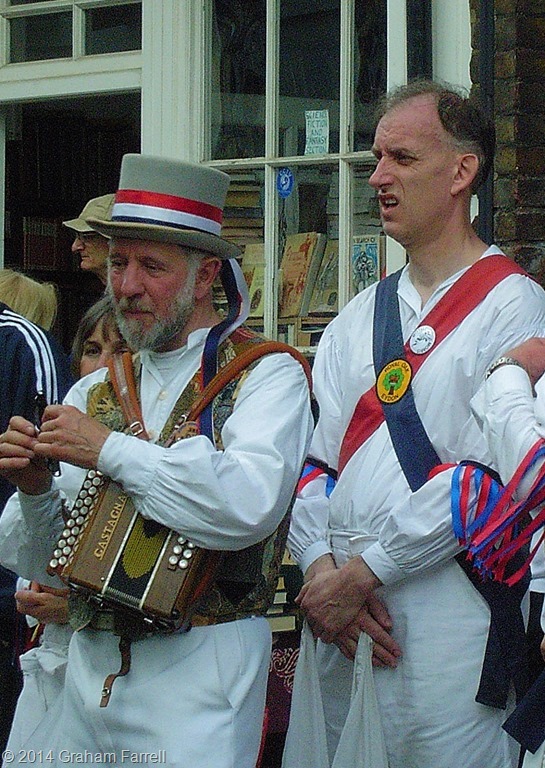 Below are some ‘traditional’ looking Morris Men. 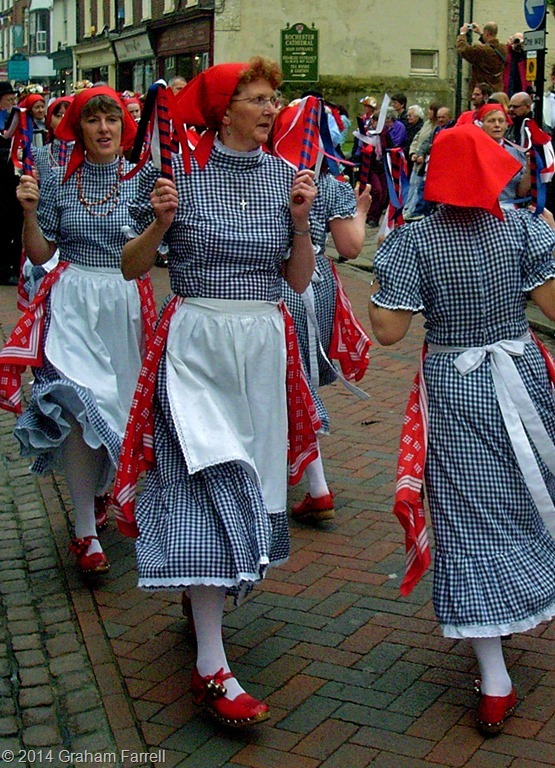 They are members of one of the sixty Morris bands that take part every year at the Sweeps’ Festival. 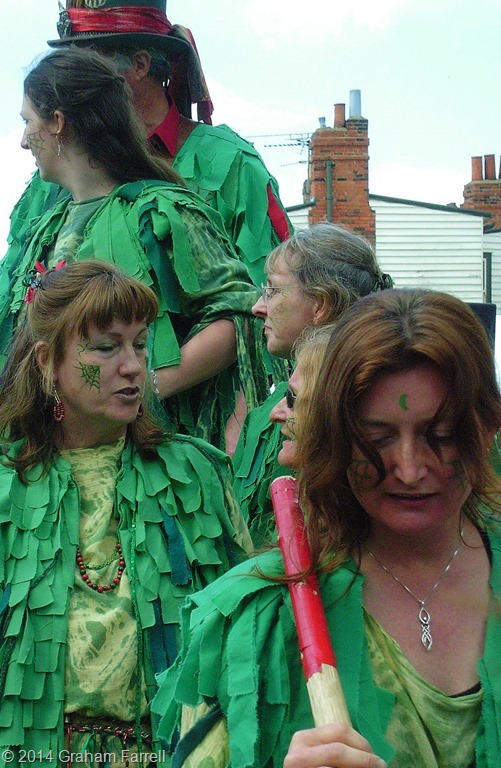 And then there are the black face Morris dancers, the Goths, the Fabulous Fezheads who sand dance, Morris dancers from the US, all women groups, clog and longsword dancers. There are even hints of S & M and nosferatu, or was that just my take on things. In any event, please enjoy the cultural concoction. I have long had a fearful fascination with volcanoes – probably ever since, as a young child in the 1950s, I saw a newsreel item of Mount Etna erupting. It seemed like a living nightmare. I remember especially the unstoppable flows of boiling lava that rolled over everything in their path. Even in places where it had cooled I seem to remember people who walked on it found their shoes smouldering. It was perhaps my first apprehension of the fact that the earth could do things that mankind was incapable dealing with. I remember having a dream afterwards where the ground beneath my feet kept cracking open into ever widening fissures: my first anxiety dream perhaps. With this in mind, you will understand how very deeply impressed I was when I first set eyes on Africa’s Great Rift Valley. Here, on the surface of the earth, we have a 4,000 mile chain of connected fissures that extends from Lebanon in the Middle East to Mozambique in south east Africa. It comprises the Jordan Rift Valley, Red Sea Rift and the East African Rift, which itself divides into eastern and western arms with Lake Victoria Nyanza in between. The entire system has been described as a world wonder, the biggest rupture in the planet’s land surface, and the only geological feature that can be seen clearly from the moon. The East African Rift of course includes the great ice-topped volcanoes of Kilimanjaro and Mount Kenya that are mere remnants of their formerly gargantuan fiery selves. So however you look at it, moon- or otherwise, the Great Rift is definitely a case of EXTREME geology. All that seismic shunt and shift. And it is still happening and at this very moment. One day the Horn of Africa and littoral East Africa will be an island. The East African Rift is thought to have begun to pull apart around 40 million years ago. Scientists surmise that the environmental changes associated with fissuring may have had a significant impact on the evolution of humankind. So far, very many of the earliest fossils of (potential) human ancestors have been found in the Rift – Olduvai Gorge, and in the vicinity of Lakes Baringo, Turkana and Omo. On the other hand, this could simply be a reflection of the decades of systematic searching in these areas, instigated largely by the Leakey dynasty of palaeontologists. But whether a good case of careful looking or not, I’m still prepared to believe that humans could have evolved here. 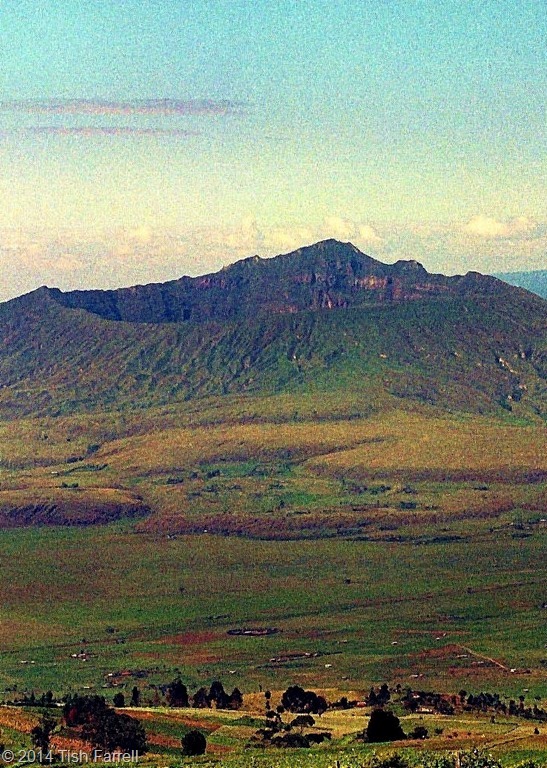 The photograph at the start of this post is of the old volcano, Longonot. It lies in the Rift between Nairobi and Naivasha in Kenya. 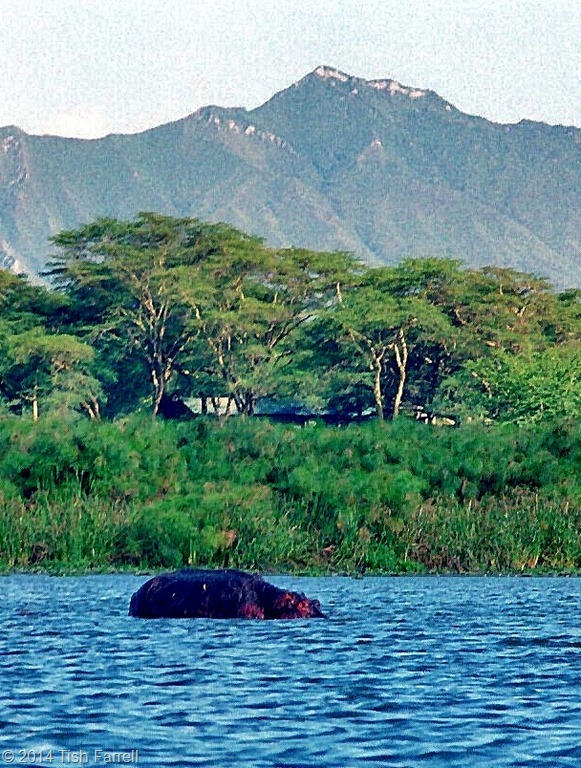 In the next shot you can see it from Lake Naivasha (hippo added for purposes of scale ). 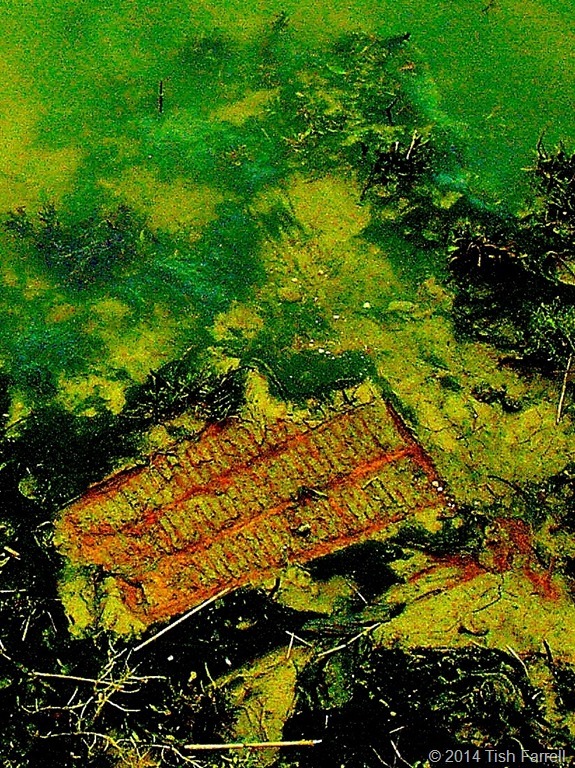 Part of this lake is also formed within a submerged crater. One key side effects of volcanic activity is highly fertile soil. In Kenya and Tanzania the Rift Valley floor supports the Serengeti grasslands that in turn are home to millions of herbivores, their following of big cat predators, and the whole wonderful species-rich eco-system. 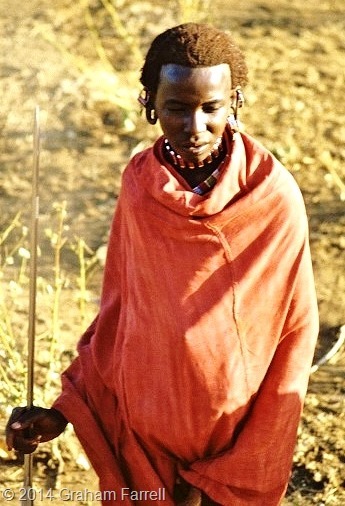 These plains also have long been the grazing grounds of the best known nomadic pastoralists on the planet, the Maasai. Before the British invaded East Africa in the late nineteenth century (intent on setting up the Imperial British East Africa Company) and concluded that any land not occupied by people at that point in time was EMPTY and thus FREELY AVAILABLE, the Maasai ranged over vast tracts of the Rift grassland system. It is believed that their ancestors moved out from the Horn of Africa about four thousand years ago. This means that the Maasai lived a life that suited them and apparently with little cost to the environment for 4,000 years before the British came along and herded them into a reserve where the land is least fertile and watered for human purposes, and otherwise known as the Maasai Mara. Europeans then set about destroying the plains’ wildlife on a breathtakingly ugly scale. The invaders, or their activities also became vectors for deadly disease – rinderpest that decimated native cattle, and smallpox and syphilis that took their toll on the human populations. Smallholder farms at Escarpment just north of Nairobi. 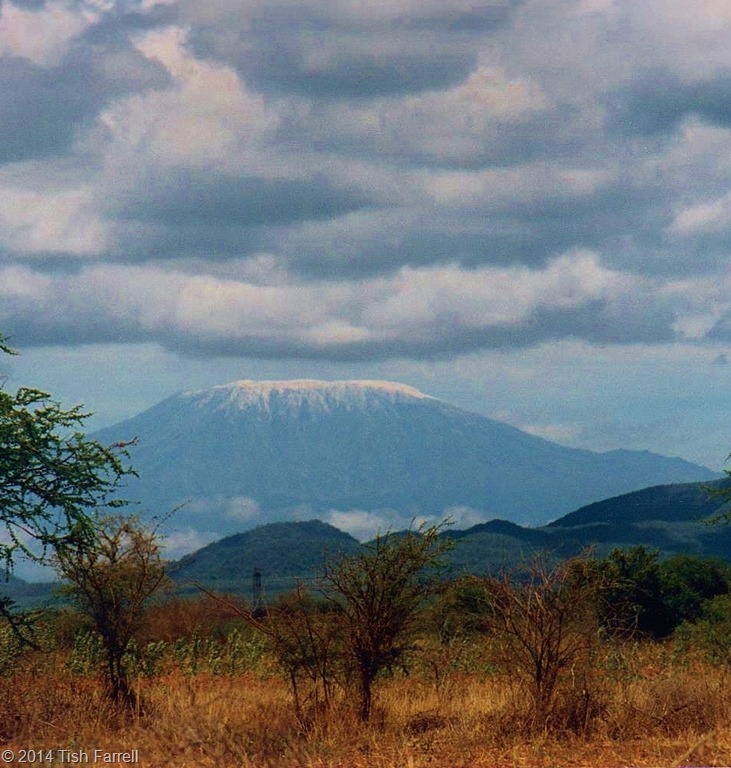 Mount Longonot beyond. 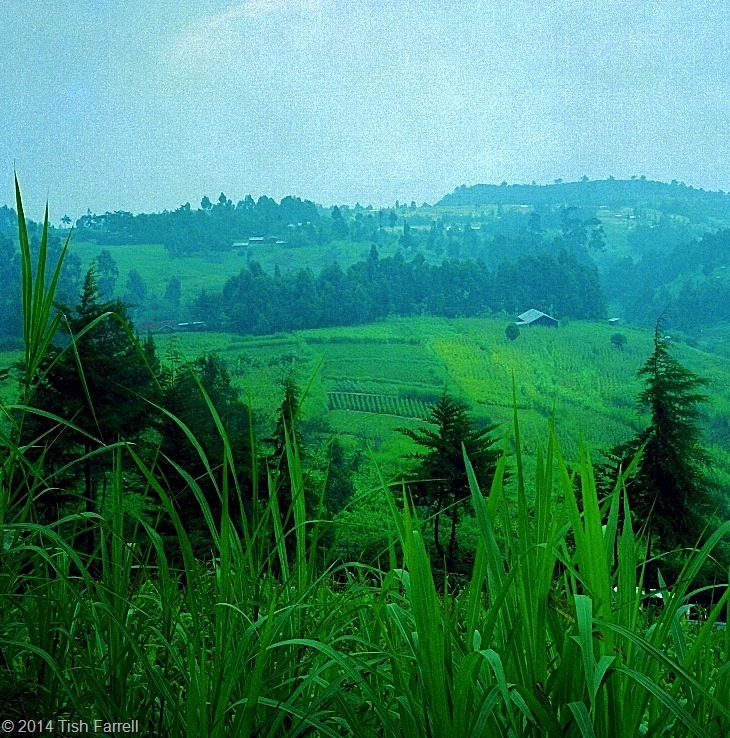 Once the British had staked their claim in British East Africa, the Bantu farming communities that inhabited the higher hillside zones of Kenya were also enclosed in Reserves. The occupants could only leave to work for Europeans. The justification for creating reserves with designated boundaries (and they were quite large areas) was to protect tribal land holdings from the incoming white settlers. African farmers, being the successful cultivators they had been for several millennia, were naturally inhabiting the best and most covetable land. So in this sense, the British administration had a point. The early settlers were British aristocrats like Lord Delamere and the sons of the Earl of Enniskillen, and thus the kind of men who expected to own vast acreages and begin farming/ranching on an industrial/landed gentry scale. Meanwhile from 1896-1902, and as a result of military paranoia of epic proportions, the British had built a very expensive 600-mile railway from Mombasa to Lake Victoria. It was called the Lunatic Line even at the time of its building. But as the strategic objective receded in importance during the early 20th century, so the Colonial Office needed settlers – well-heeled, gentlemen of means who would grow produce for export and so help pay for the railway. 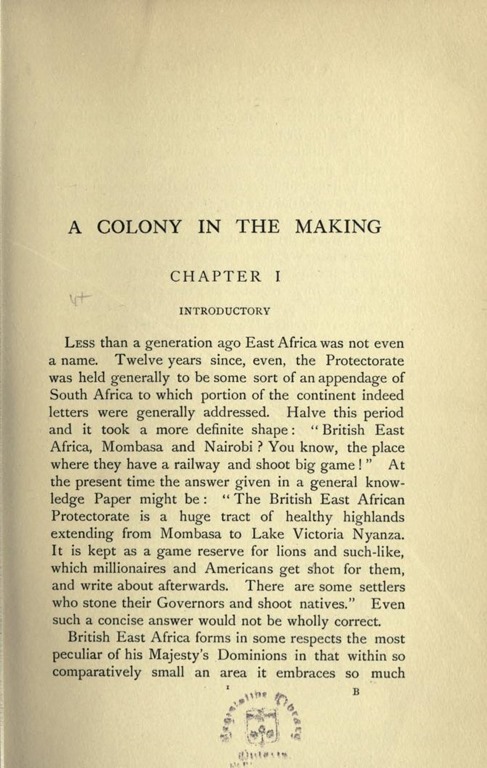 First page of Lord Cranworth’s A Colony in the Making: Or Sport and Profit in British East Africa, Macmillan 1912. A guidebook and general sales pitch to attract gentleman settlers. (Out of copyright). Thus, in the wake of the adventure-aristocrats came retired military men, among them individuals who were variously set on nation-building, knocking the natives into shape and, in the process, getting rich from flax, ostrich feathers and coffee. The country’s fine shooting and fishing were definite lures, and made much of in the publicity brochures sent out from British East Africa. Other attractions included the notion of plentiful cheap farm labour and house servants, and thus the preservation of social status that was already well on the wane for the middle classes back in Blighty. But now we come to the rub. Or in fact two rubs. Firstly, when the monsoon winds are blowing in the right direction, Kenya has the most benign climate imaginable, providing two rainy seasons, and thus two and sometimes three growing seasons for some crops. 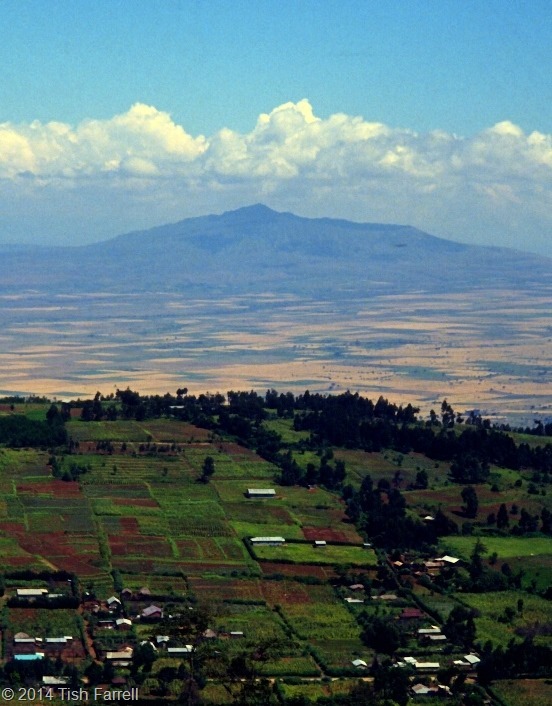 The elevated plateau of Central Province in particular, and its Aberdares highlands are rarely too hot. 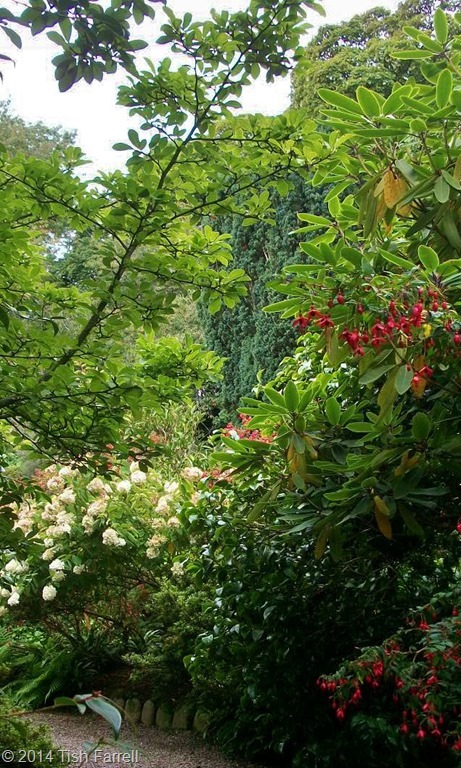 The beauty of the great forests suggested Scotland or Wales rather than Africa to the newcomers. 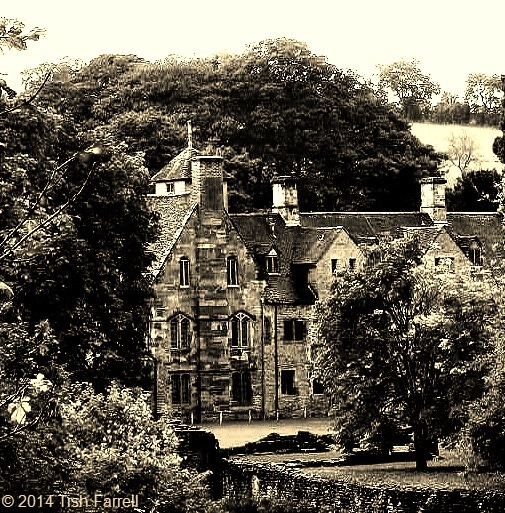 They set about building mini-baronial lodges and laying out English lawns and rose beds. But then comes the other rub. The soil. As I’ve said, volcanic soils are very fertile, but they are also very fragile. Wholesale clearance of trees and bush will quickly create desert. 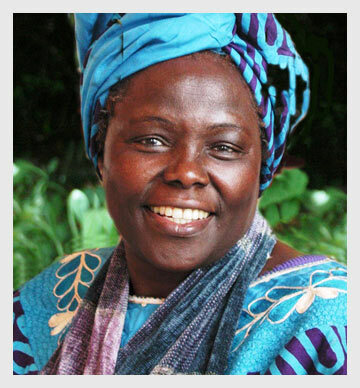 The late, great Kenyan environmentalist, Wangari Maathai, has maintained that felling deeply rooting forest trees ultimately leads to desertification for a whole range of reasons. The forests not only attract rain but the trees shelter, stabilize and feed the soil (many tropical species fix nitrogen). Most importantly, she pointed out, the deep roots open up underground aquifers to water the land. 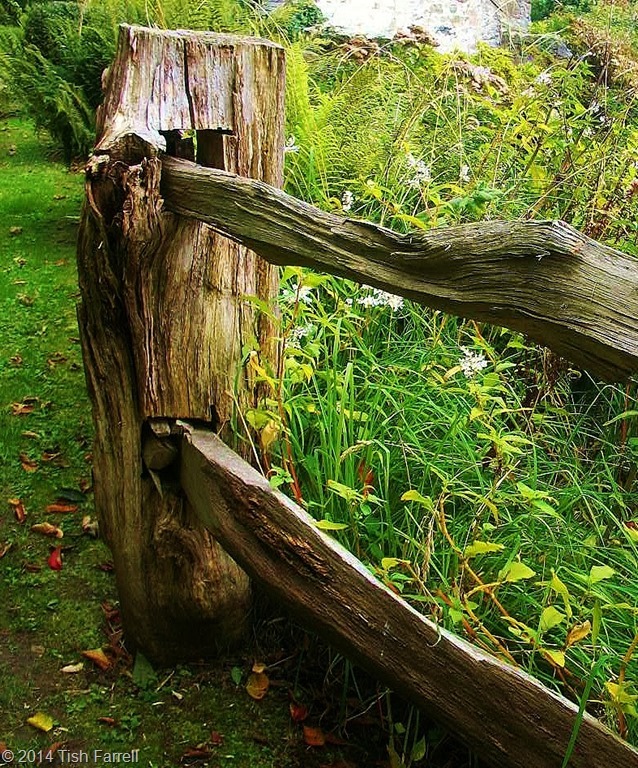 Traditional farmers of course made gardens within the forest rather than large fields. They cleared trees certainly, but they did not clear all trees. Some had sacred meaning, like the wild fig, and were protected. 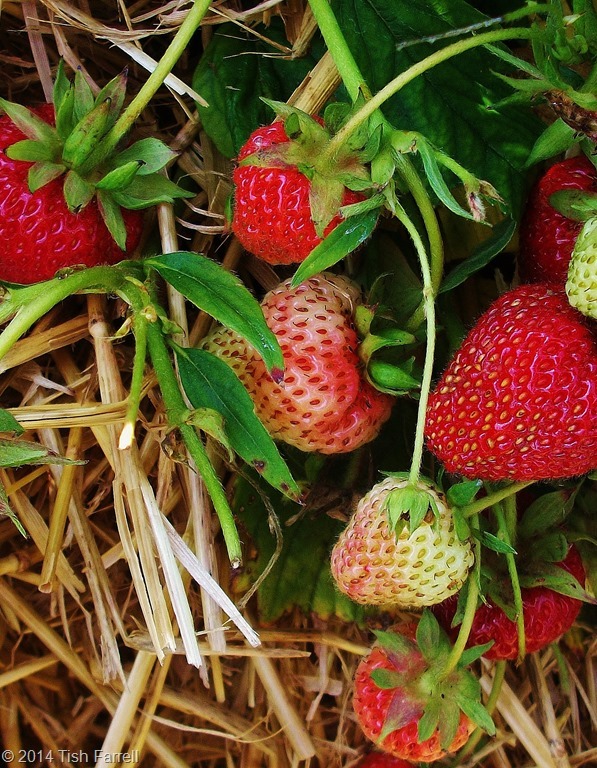 Others were valued for cropping purposes – for animal fodder, medicine, bee forage etc. When the old colonials set out for Africa on a cash-cropping spree, full of the notions that they knew best how to farm, they singularly failed to understand that indigenous peoples, far from being ‘undeveloped’, had very good reasons for doing things the way they did them. Their objectives were more about living well than getting rich. Pre-colonial accounts by explorers and missionaries show that the Bantu peoples were very successful farmers. 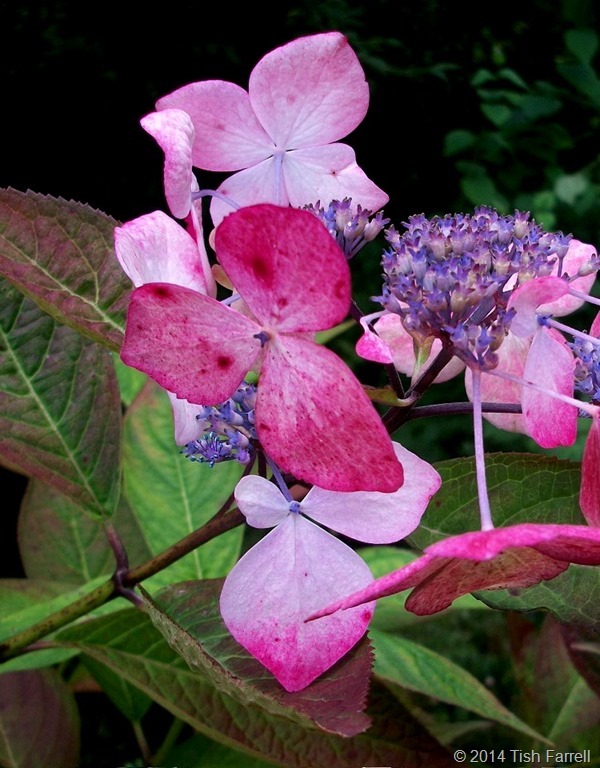 They planned their planting to take into account the possible vagaries of climate. For instance, drought resistant millet might be the mainstay crop, and cultivated on the drier soils in their territory. Squashes and beans would be grown near stream beds, and water-hungry maize would be the risk crop, planted on a river bank on the off chance that seasonal floods would be small enough not to wash the crop away, but good enough to provide a bonus to the annual harvest. The other important contingency depended on kinship and clan ties. As the Bantu communities moved out across the African continent over many centuries, pioneering into new territories as population growth or failing soil fertility dictated, networks of clan relationships became extended over quite large territories. If drought, disease or invaders struck, people would take their possessions and seek refuge with distant relatives until the threat had passed. Pastoralists like the Maasai also relied on being able to move over large distances to secure grazing for their herds in times of drought. But once people were confined to reserves, bound by European constructs of land ownership, they could not move. Land in the Native Reserves where people farmed thus became overcrowded, degraded and overgrazed. Under colonial rule Africans were not allowed to acquire fresh land. This was one of the chief reasons for the uprising in 1950s Kenya when the Land and Freedom Army (dubbed Mau Mau) went to war against British rule. Then there were the colonial agriculture officers trying to dictate the way the people on the Reserves grew their crops, pressing for mono-culture rather than the traditional way of mixing crops which helps to fool insect pests and utilizes advantages of companion planting. 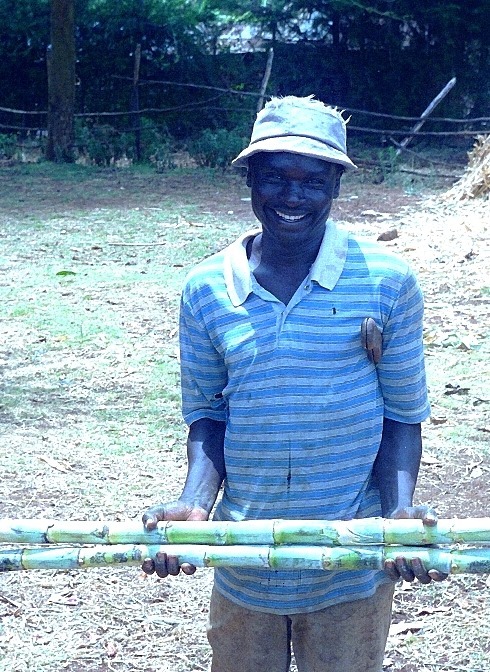 As we left Kenya in 2000 I was interested to learn that some European agricultural aid project was actually advocating that smallholder farmers (which means most Kenyans) should use ‘kitchen-garden’ planting techniques to reduce crop pest damage and/or the need for pesticides. It had only taken a hundred years for outsiders to teach Africans what they had known all along, but doubtless been told to forget in the interim because their methods were considered primitive. Lust to rust: is it a sign?